Finally it was time to leave Samarkand. At the hostel there were now 11 cyclists and three had left the day before. 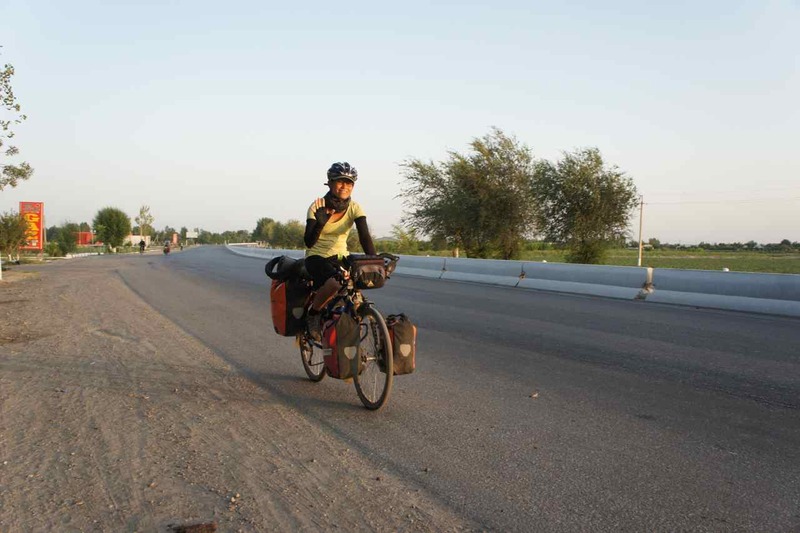 Most of them are heading towards the Pamirs while some have just arrived from that area and are going towards Iran. 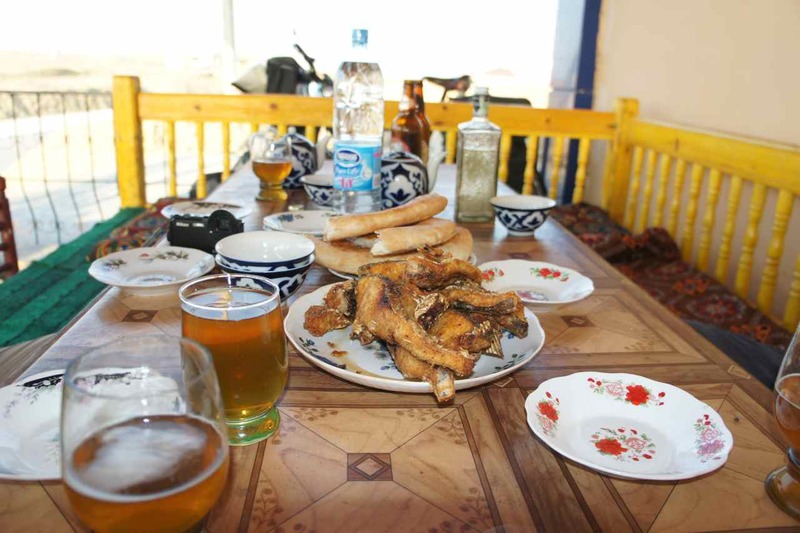 We have been to the Pamirs before so we have decided since long ago to exit Uzbekistan through the Fergana valley. Simon in the white shirt got nick named “Jesus” – take a close look and you’ll see why. 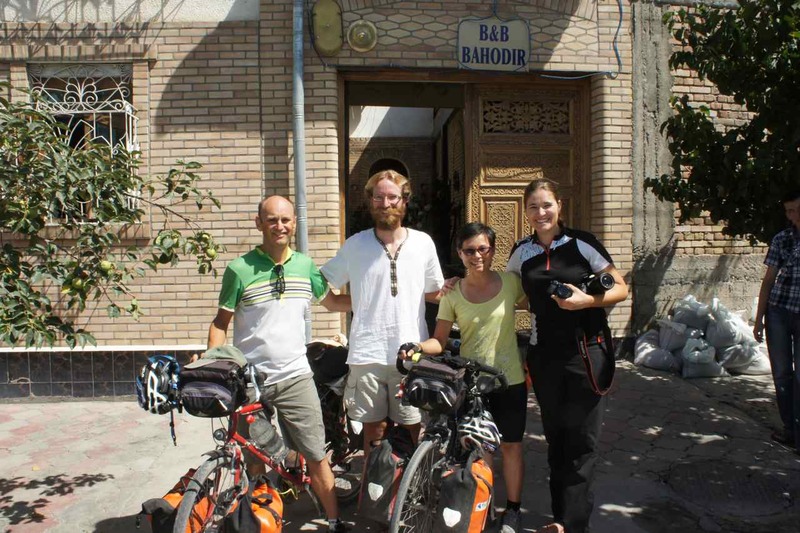 Maria from Switzerland managed to get an Iranian visa and biked through during the election times. We have now travelled together for more than a month. Not that we have been together all the time because we have split from time to time, but we have had these friends around us for some time now and it feels a bit sad to part. Saying goodbye took a long time and instead of starting at 7.00 we weren’t on the road until 10.30. 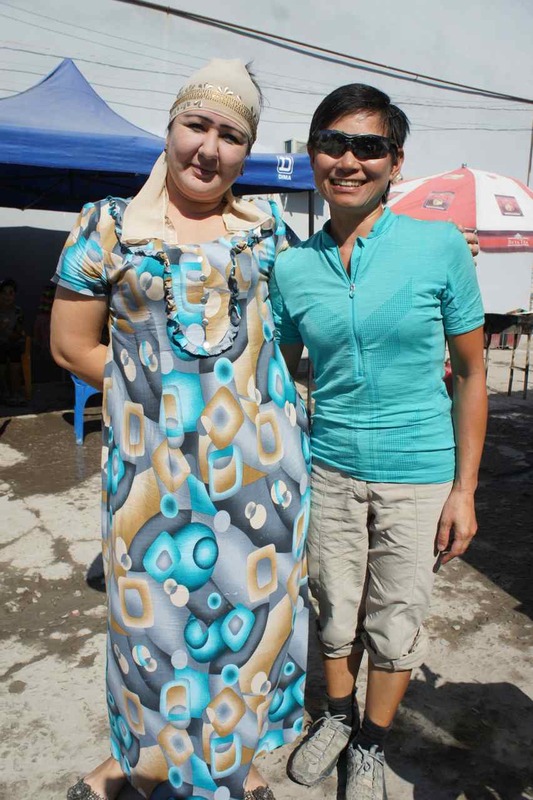 It was a strong headwind all day and we tried to cycle extra slowly to not run out of energy before arriving at the town of Jizzakh. Fortunately the temperature had dropped a few degrees and it was now possible to ride in the afternoon without suffering from the heat. 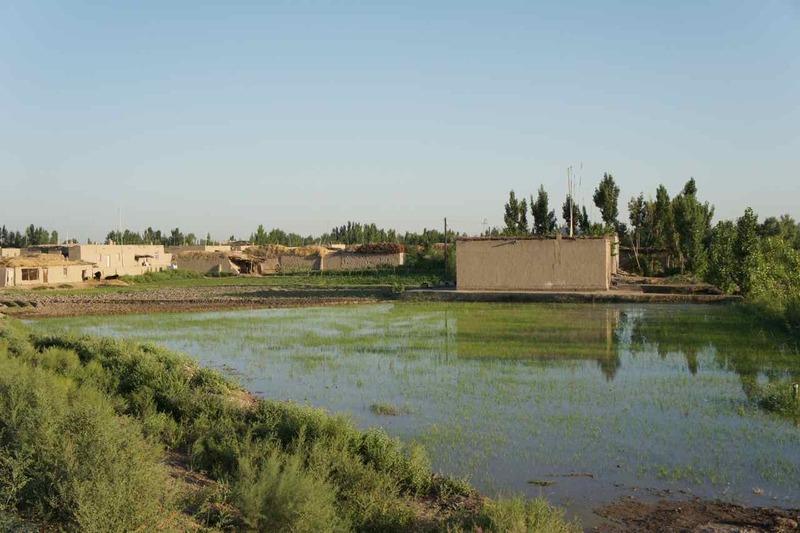 The landscape after Samarkand is much more interesting than in the western part of the country. Green surroundings and everywhere we could see people working on the fields. It seems that the endless flatland is replaced by a landscape of small hills. Finally there is something nice to look at as we pedal through. 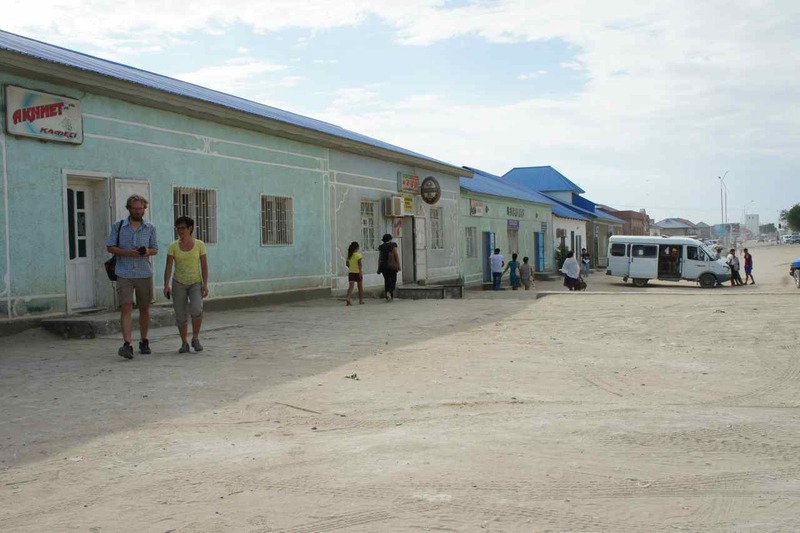 Jizzakh is a bigger town than we had thought. 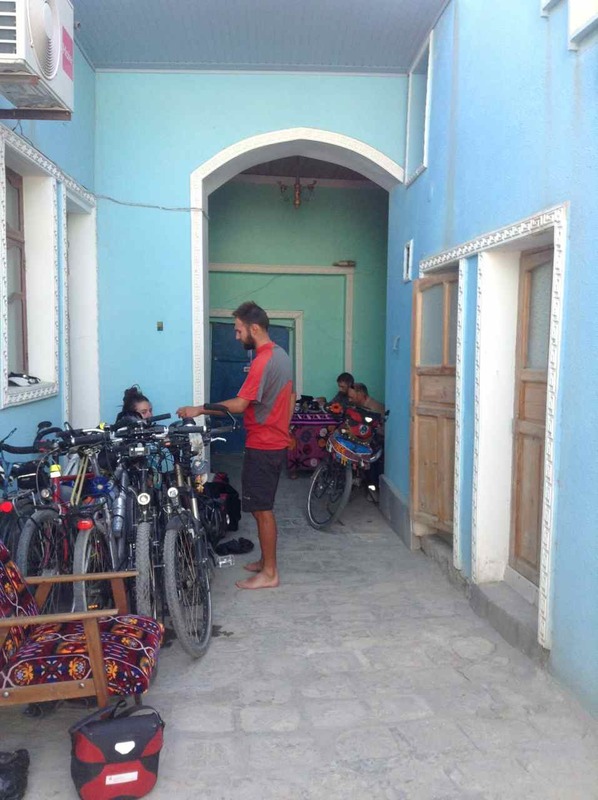 Some swiss cyclists at the guesthouse in Samarkand had told us about a hotel near the railway station that is not only cheap but also able to register foreign tourists. The problem was that we couldn’t find the hotel and when we saw a sign for another hotel we decided to try our luck there instead. The hotel was located in a small side street with lots of commerce going on. The barber shops were open late and there were small restaurants and mini markets. 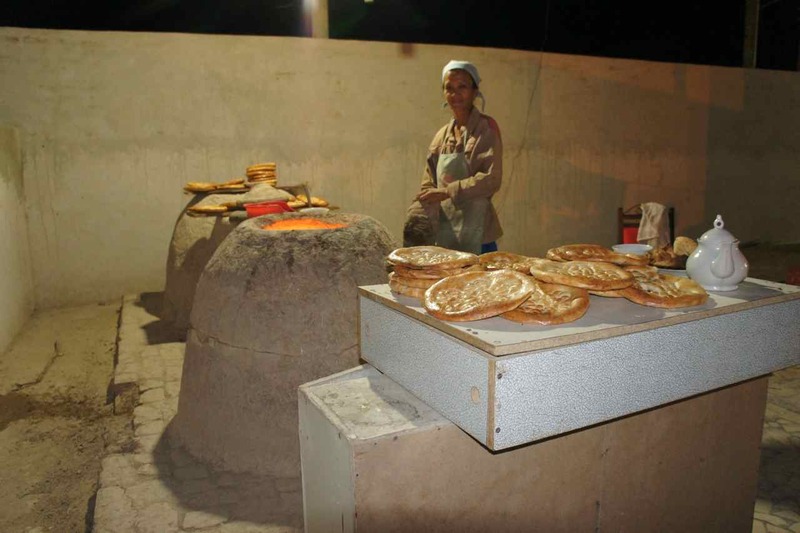 Bread vendors sat next to each other selling exactly the same kind of bread. Do they compete or do they work together, or is it simply so that their breads taste differently? Our taste buds are not enough developed to detect any difference. The side road was only 100 meter long but both of us got a feeling of being on a busy side street in Bangkok or any other Thai city during a late evening. The fact that people look more asian enhanced that feeling too. The hotel is a local business hotel with a standard that is higher than anything we have experienced for a very long time. It is a normal hotel room, it is very clean, has a nice bed, TV, fridge and a nice bathroom. We are not used to this standard anymore and got extra happy when we bumped into such a hotel by accident. We didn’t want to leave our cosy and clean hotel room, but sometimes there is no mercy to be on a cycle tour. 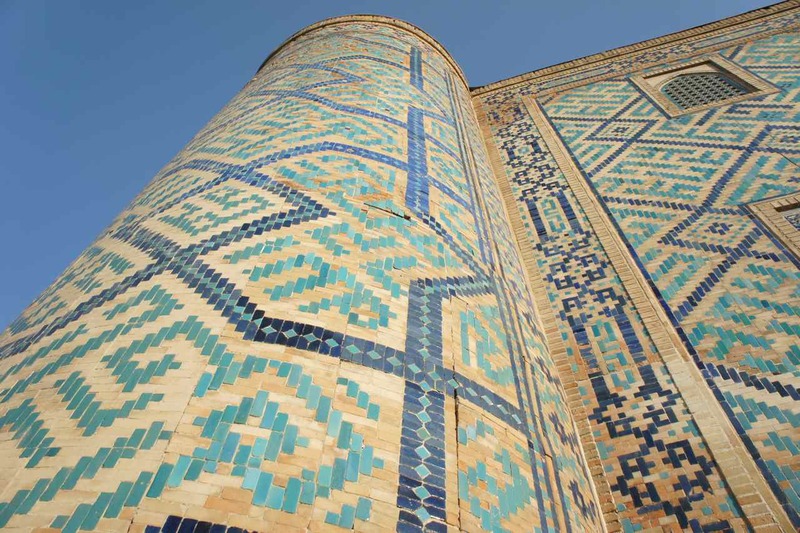 The visa clock for Uzbekistan is ticking and we must move on. 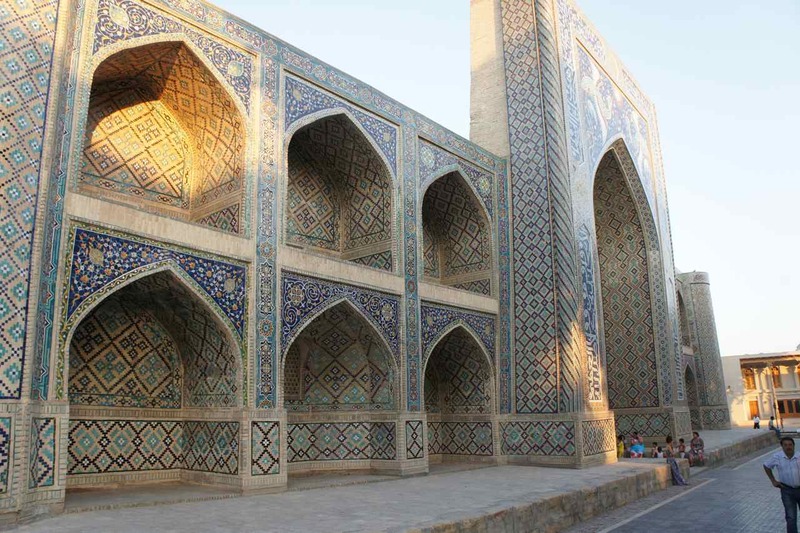 Overstaying the visa validity in Uzbekistan is a really stupid thing to do since the fines are huge. 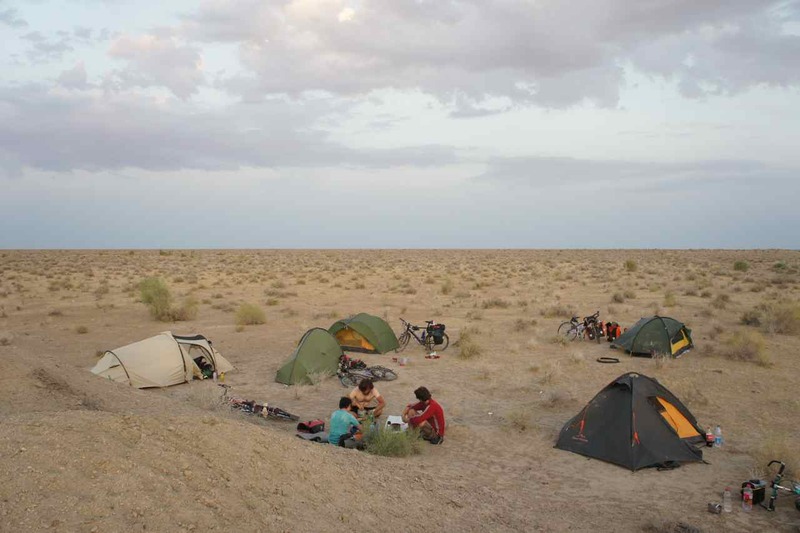 There was no wind in the morning and it was cooler than the days when we cycled to Samarkand. On the way out of town we passed a very big market with roads leading through it. Some of these roads through the market had sections where minibuses stop to pick up passangers and once again it felt like we were already in Thailand. 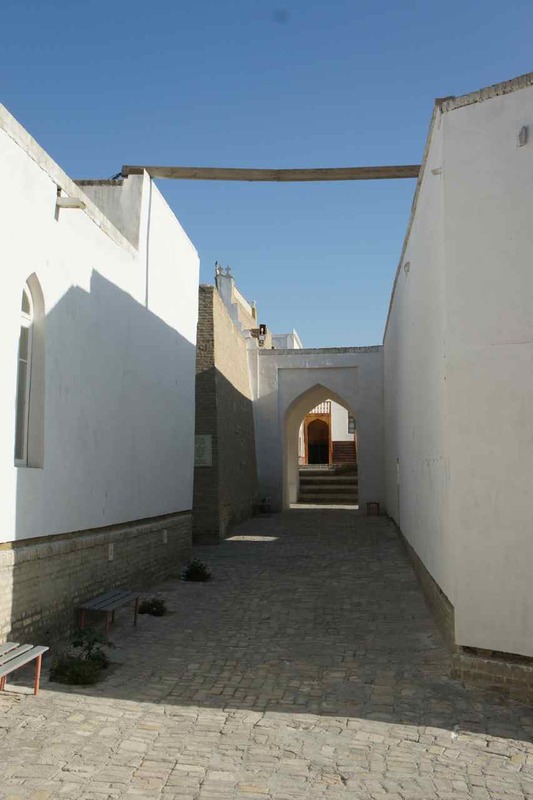 Our target for the day was the town of Gullistan. Outside town the road split and we could take either way to but we didn’t know which to choose. 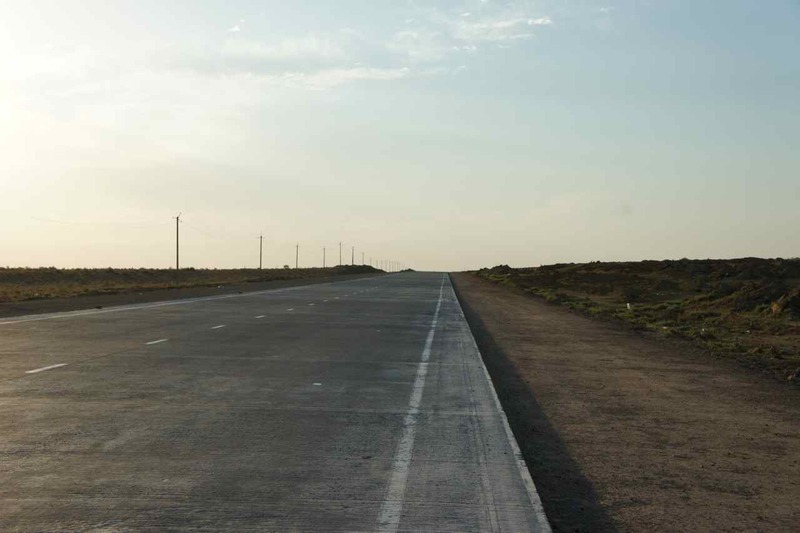 Asking people only gave us very different answers until we met someone who argued that we should take the road towards Tashkent because it was of better quality and also shorter. We decided to follow that advice. The road was indeed good and we kept going at high speed. After 55 km we saw a big sign telling that we should go right at the next intersection. It felt a bit too early to turn, but if the signs say that is the way, then why hesitate? Soon we were on bumpy gravel roads and my built in compass made me feel that it was all wrong. We stopped and asked people and got more and more different answers and we felt really confused. 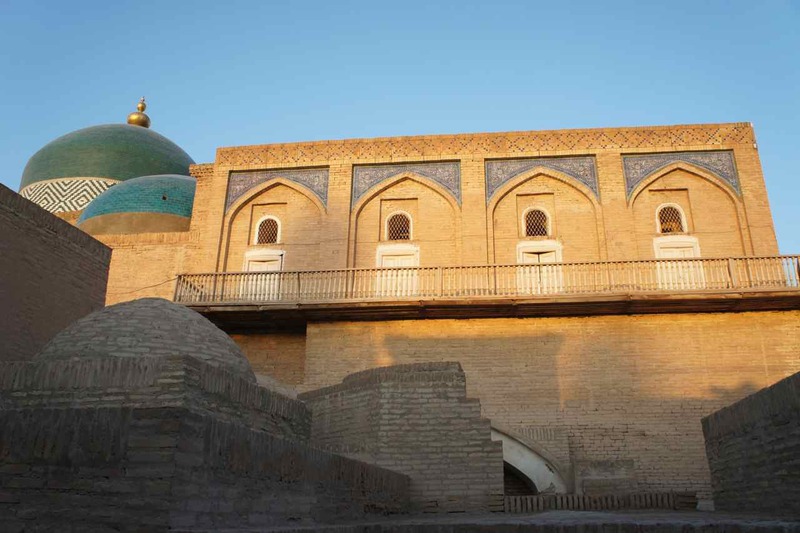 Not that we don’t believe the locals – they all know the road to Gulistan, but the language barrier made it problematic to communicate. We have done many tours by bicycle and shouldn’t fall into such easy traps. The rule is to always aske two different persons for direction and if the indicate the same then go that way. If the indicate different ways, then ask more people. The guy who made the map told us to go straight, then when at the intersection we asked another one, who clearly got confused by the question and first told us to go straight, but then changed his mind to turn right. So now we had two different opinions and the rule is then to ask more people, but we didn’t and ended up in the wrong town and loosing 40-50 km. 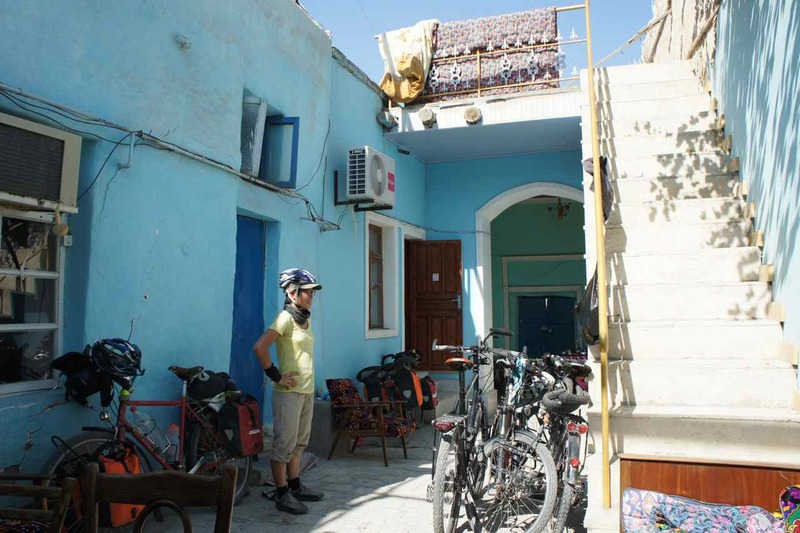 Fortunately some cyclists at the guesthouse in Samarkand had told us about this town and that there was a hotel there so we knew there would be somewhere we could stay. We saw a car parked at the side of the highway about one kilometer outside town and we thought it could be a good idea to stop and ask for directions to the hotel. When getting closer to the car we saw a women sitting in the backseat facing backwards and below her the head of a man who had his face forward. Something was obviously going on in that car that we didn’t want to interrupt and we decided to continue and ask someone else instead. One kilometer down the road road goes up on a ramp to a bridge across the railway. We saw another car parked below that ramp but it was difficult to get to so we decided to ask someone else. When we were on that ramp we it was once again obvious what was going on in that other car too. Secret activities in two cars within a kilometer from each other – this must be a sign of something. Either it was dirty business going on in those cars or the youngsters in that little town have nowhere to be alone with their girl/boyfriends. When we finally arrived in the hotel we were told we can stay for free and the only thing we had to pay for was the food in the restaurant. We were very careful when we studied the prices in the meny but it turned out to be normal prices that we would have payed anywhere. 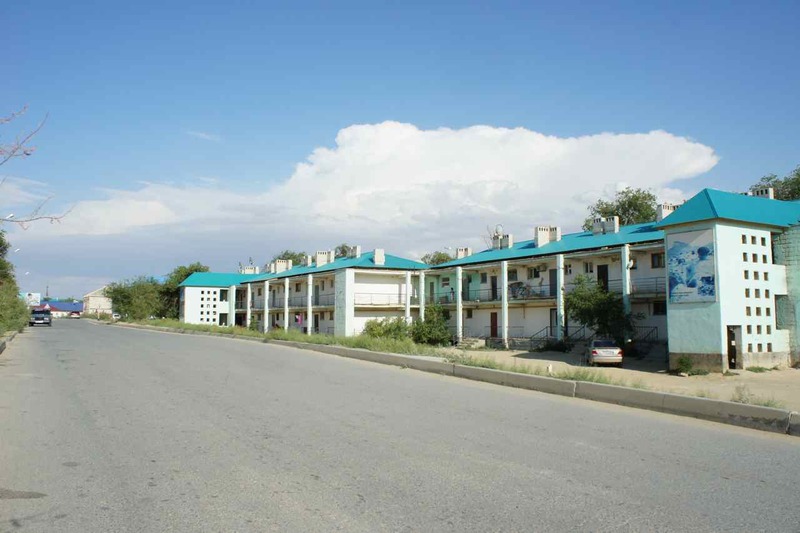 The hotel only had four rooms and no breakfast was included and knowing we would be in the bigger town of Gulistan within 90 minutes we only ate a couple of sandwiches in the room before leaving. The small family run hotel we stayed. Half of the family had emigrated to Israel but came back one month every year. 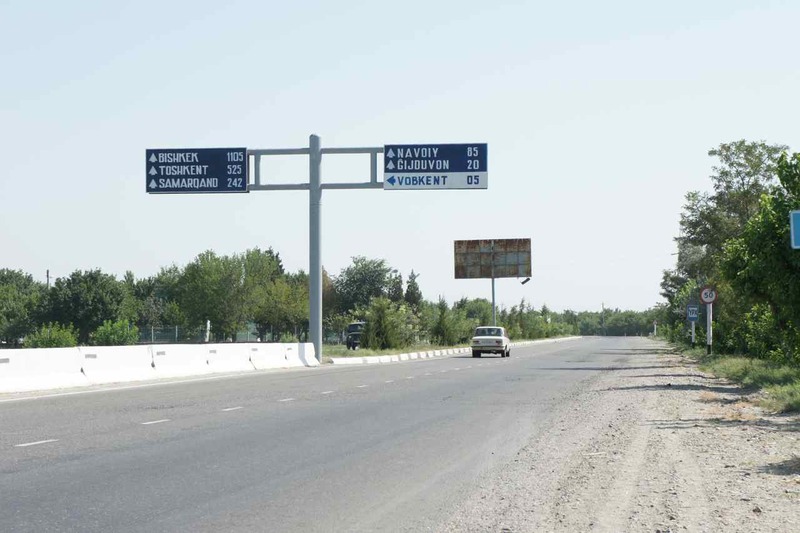 We never went into the center of Gulistan and only passed it on the big highway leading to Tashkent. 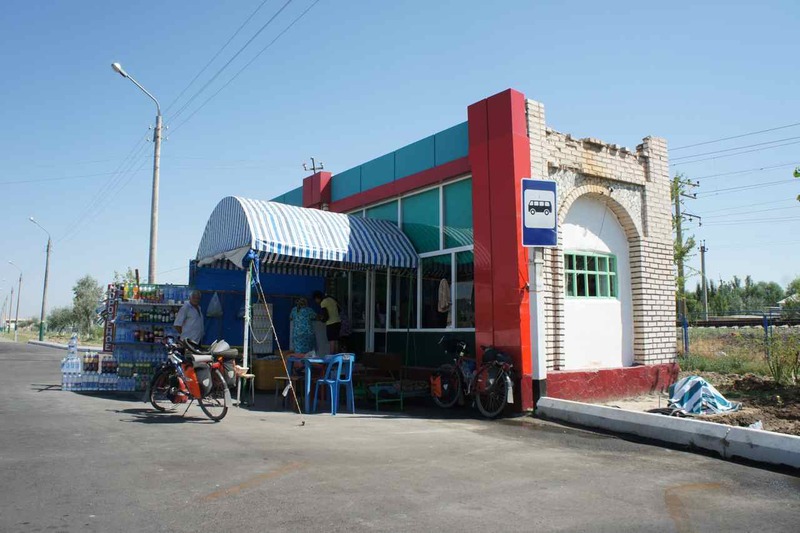 There were lots of small stalls selling water, soft drinks and bread but we decided to stop at one just after the town. The one we found looked different from the others. It had a single table with a plate with boiled eggs for the guests to eat and so we decided to stop at that little pretty place. We are traveling through tea land now but this place had coffee where you could select if you wanted sugar and milk instead of the disgusting 3in1 instant coffee that are usually served. Plenty of fresh pirogs made it to be the complete roadside breakfast to be had in this country. The people running the place were very nice too. I think they were ethnic russians and spoke only uzbek and russian, but we managed to have some fun while we enjoyed our breakfast. A neighbour to the lady running the place dropped by and got engaged in the conversation and told us he had been posted to south Poland during his army service many decades ago. When we left, the shopkeepers daughter offered us some free icecream which we really enjoyed since it already had started to get hot. The road was very good and we moved forward at a steady pace of 25 km/h which is good with our heavy bikes. While cruising at high speed we discussed when we had a flat tyre last time. That was a stupid thing to do because at the next intersection I heard a ”pffft” sound and I had got another flat. 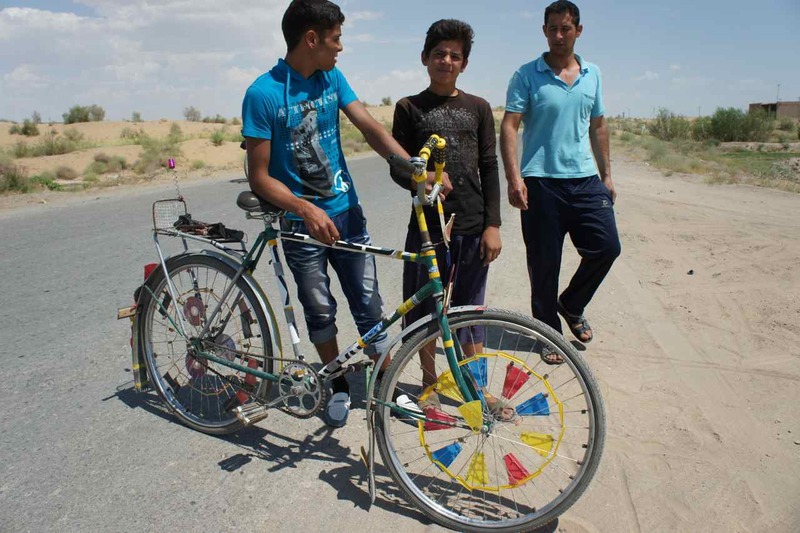 A new rule is to never talk about flat tyres…..
After fixing my flat tyre we turned east from the main road leading to Tashkent. 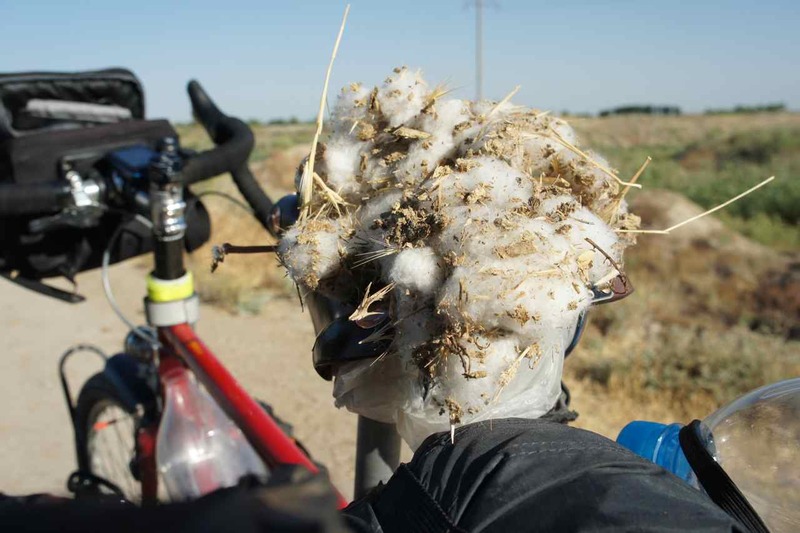 We were afraid it would be of poor quality, but it turned out to be very good and we could keep on going at good speed passing endless cotton fields. It is melon season now and we enjoy one or two stops a water melon vendor each day. 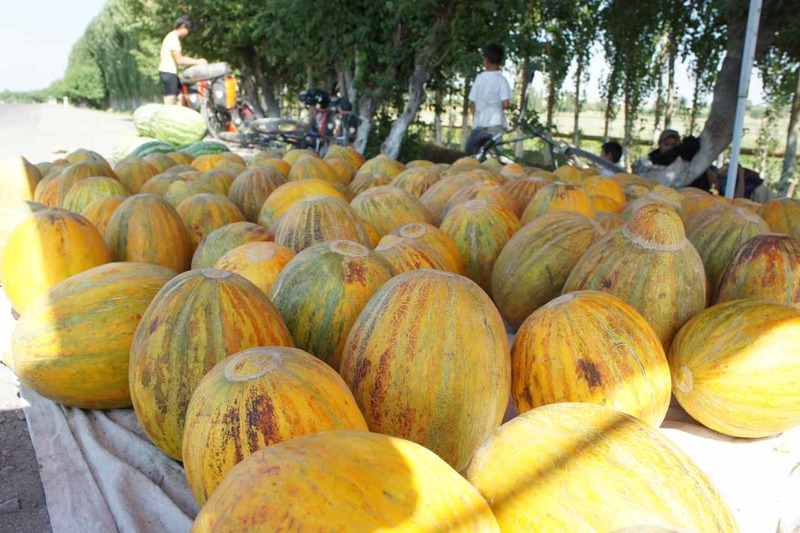 They usually put their melons in a big pile and sit and wait for customers in the shade. We drink a lot during a day and eating water melons is a welcome change to drinking warm water from our bottles. Since we sweat a lot (our shirt gets white stripes of salt on the back each day) both of us has got an increased taste for salt. We both miss the salt and dried chilli mix that is included when buying fresh fruit from vendors in Thailand. We stopped one more time to eat some bread and buy some water at another roadside vendor selling ”ayran” which we learned to enjoy in Turkey. Ayran is a mix of youghurt and water with added salt. 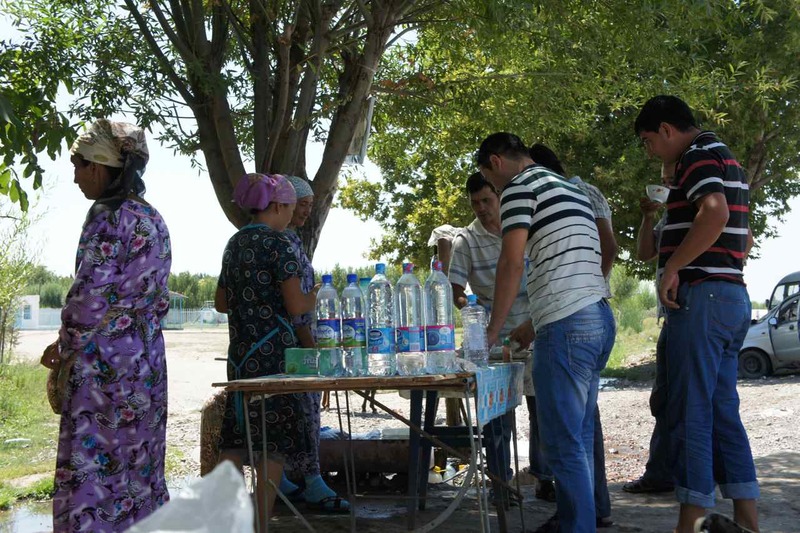 Three ladies were selling home made ayran beside the road just next to a huge pipe pouring out water into a canal. It was a good place to make money since many of the people who stopped to fetch water or just wash their faces also bought some ayran. 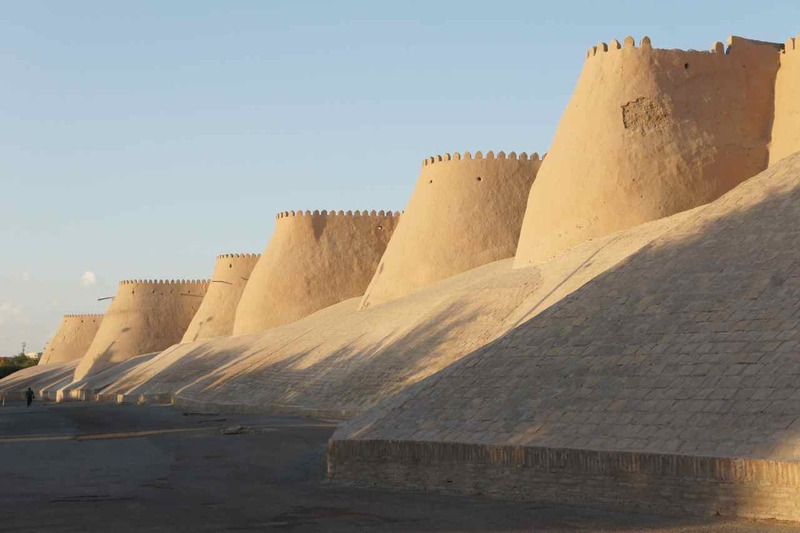 In the late afternoon we approached the city of Olmaliq. 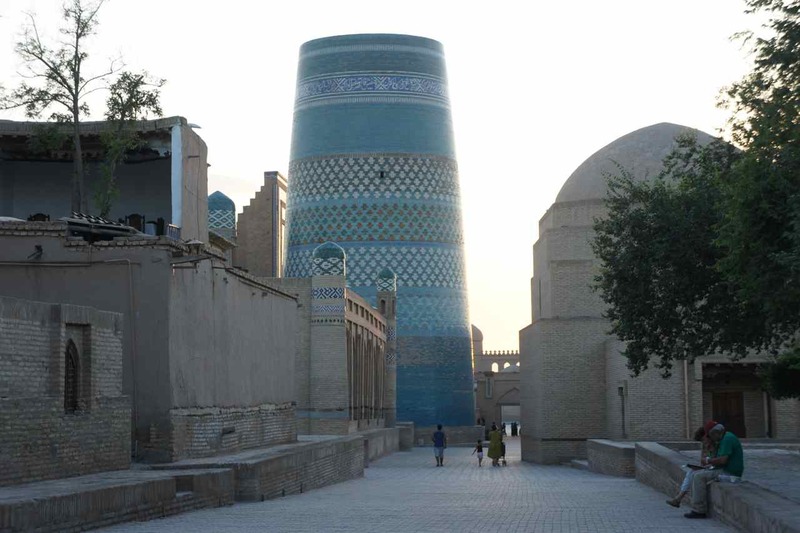 A week ago I didn’t know that there was a city with this name, but before leaving Samarkand I googled the town and knew it was a city relying on heavy industry. 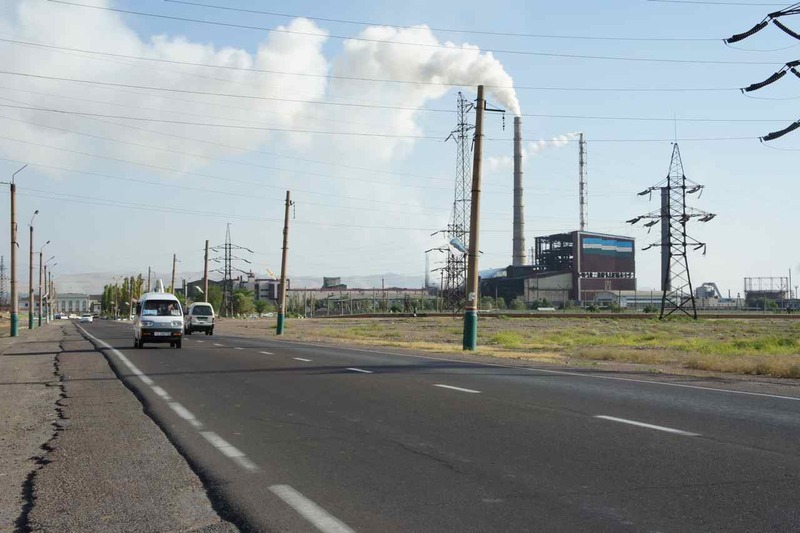 Already far from town we saw big piles of slag and tall chimneys from which grey smoke was billowing up to the sky. It didn’t look healthy and when we rode past the piles of slag we could see that the factory was very old and worn I thought it all resembled the factory portraied in the Deer Hunter movie. 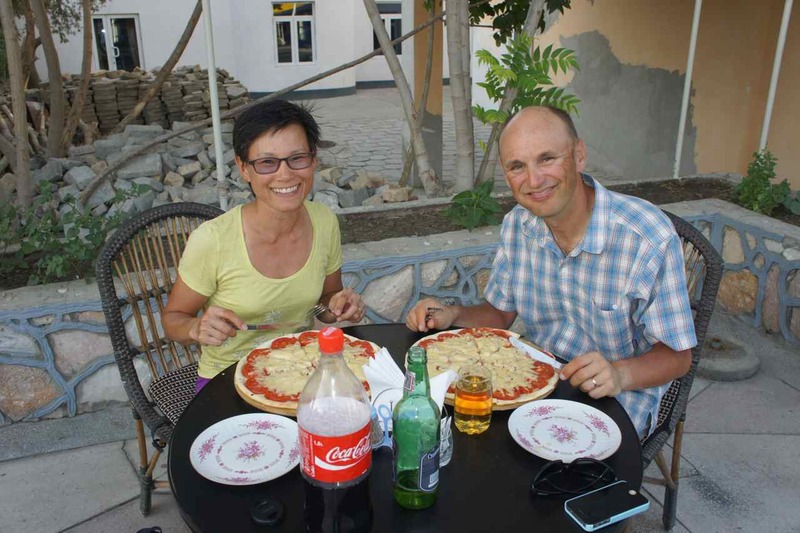 As mentioned before we do feel a bit exhausted and we have decided to opt for the simple and convenient way of doing things which means staying at hotels. The good thing with this is also that we get the opportunity to collect the stupid registration slips. When passing the factory we saw no sign of where the city center is and we stopped a worker walking towards the bus stop to ask for directions into town. He made a very precise description and we started to pedal the remaining 4 km to the center. After a kilometer we came to yet another old and very worn industrial building with the fancy name of ”locomotive deposi” on it. We guess it was a train depot and the little monument outside was just as colorful that the rest of the building was not…. The city was bigger than we thought and we stopped at a large intersection to ask for directions to the hotel which was just behind the next corner. I went in and found a very charming lady who certainly hadn’t understood that the soviet union had ceased to exist. She didn’t know how to smile, she almost yelled at me and she only rose from her chair to go and slap the feet of a teenager who wasn’t sitting properly in the sofas. Besides the customer friendly appeal it was also ridicously expensive so I showed her a bit of the basics in a market economy by simply walking away. She had the supply of rooms, but the demand was gone. A little bit more customer oriented behaviour would have led to some cash in the register…. Wej was waiting outside and next to the reception there was a large dining room and loud music came from it. 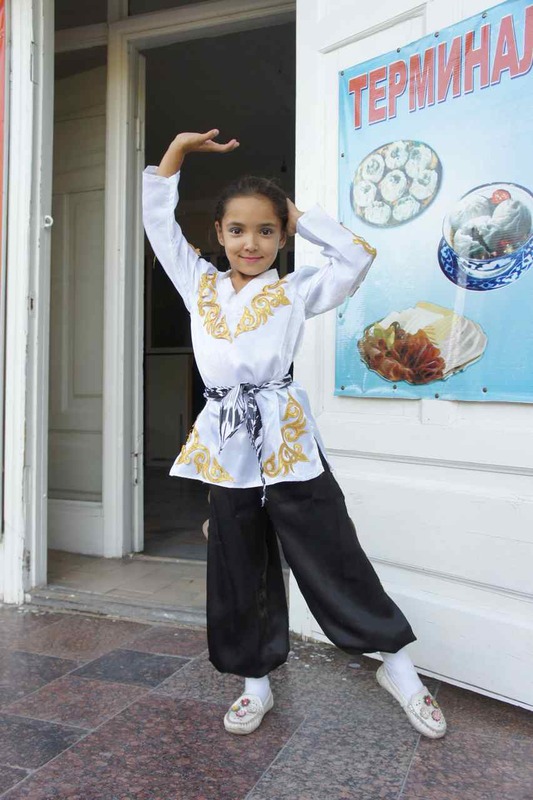 We glanced into the room and could see old ladies having dinner while young girls in traditional dresses had a dance show to the rock’n roll version of the traditional russian song ”Ochie Chornie” (Black Eyes) which I am sure you all know when you hear it. We met people outside the hotel who told us there were a much nicer hotel in the other end of the city center. They made a simple map of how to go there and off we went. At an intersection we stopped to ask a young man for further directions and the first thing he did was to ask if I was a spy. I sincerely hope he was ironic but unfortunately he didn’t look lite that. When we were wating for green light at another intersection another young man walked up to us and started to talk to us in very good English. 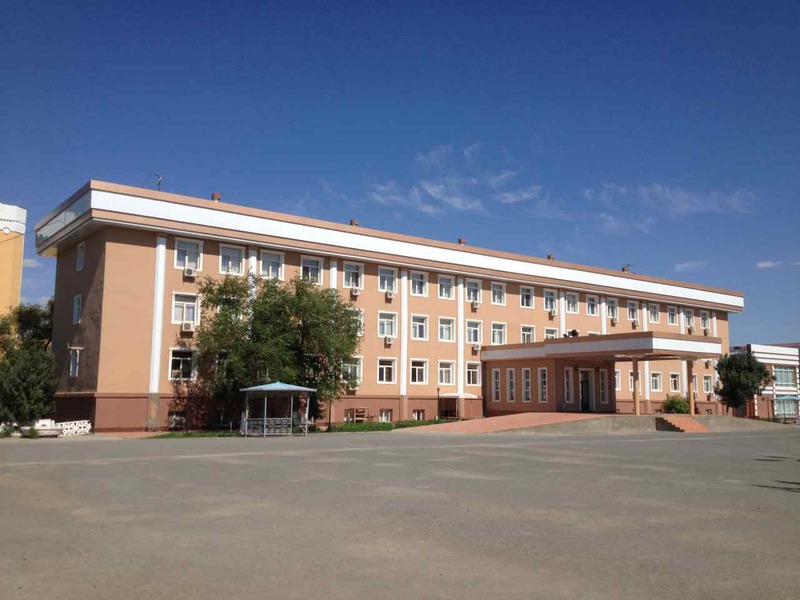 It turned out that he just got his degree from Tashkent university where he had majored in Enlish. Now he is eager to go and study for a masters degree and he is eying at Korea or Malaysia. 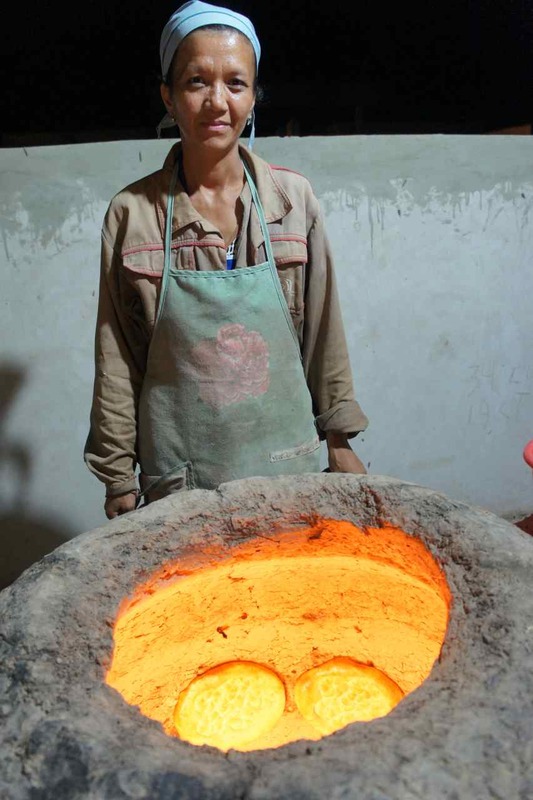 I hope he succeds because Uzbekistan needs more people like him. Finally we made it to the hotel that turned out to be more expensive than we had been told. It was too late to go for the plan B which was to go out of town and find a tea house where we could camp. There was no option than to accept, pay and check in. When cycling to the hotel we passed a place selling döner kebap and still on the bikes we decided to have our dinner there. Later when we left the hotel to walk there we found a schaslyk (barbecue) restaurant only 100 meter from the hotel. 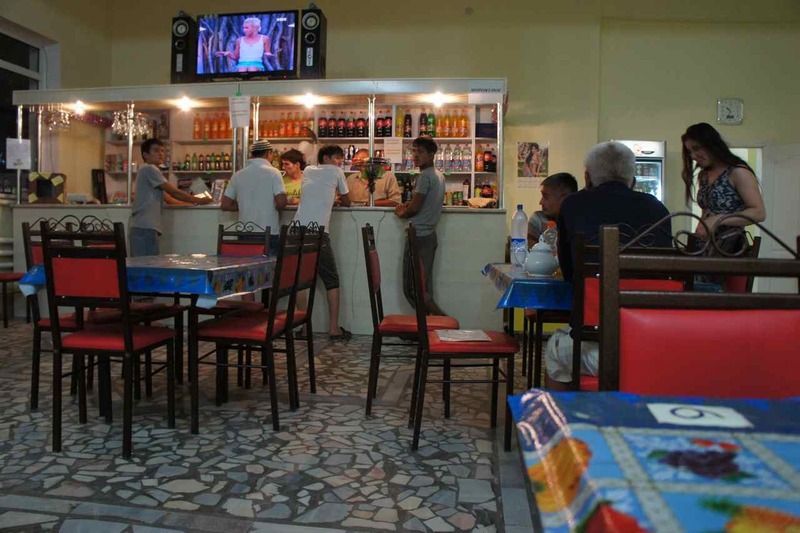 It was more of a local pub than a restaurant and it was very busy since it was a Friday night. Russian and western music was played inside and the guests were talking loudly not only because of the volume of the music but also of the volume of beer they had consumed. We decided to sit at one of the tables on the outside and the servant was busy running in and out all the time. The owner was tending to the schaslyk grill on the pavement and when a fist fight started some 15-20 meters away he quickly told all able men to go and separate the fighters. 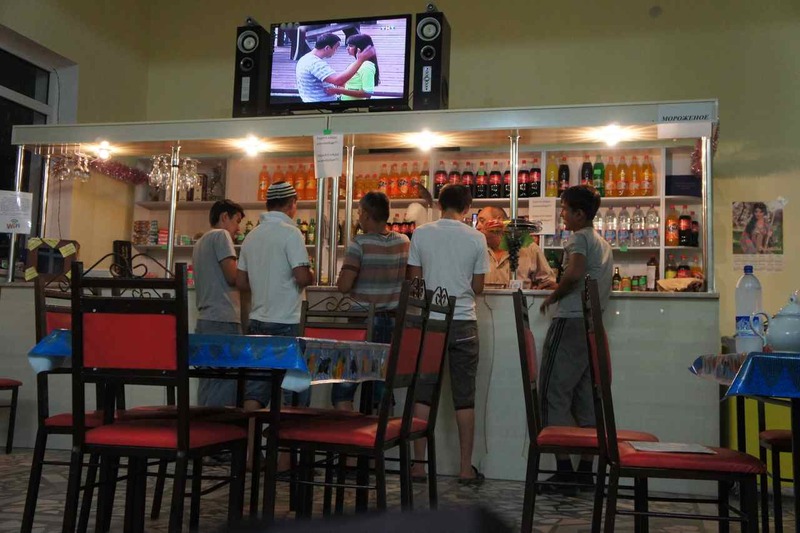 Sitting in this local pub, seeing all these men from the factory enjoying their Friday night made me once again think Pennsylvanian town portrayed in the Deer Hunter – maybe it has a sister town in Uzbekistan. This entry was posted in Posts in English on July 27, 2013 by admin. 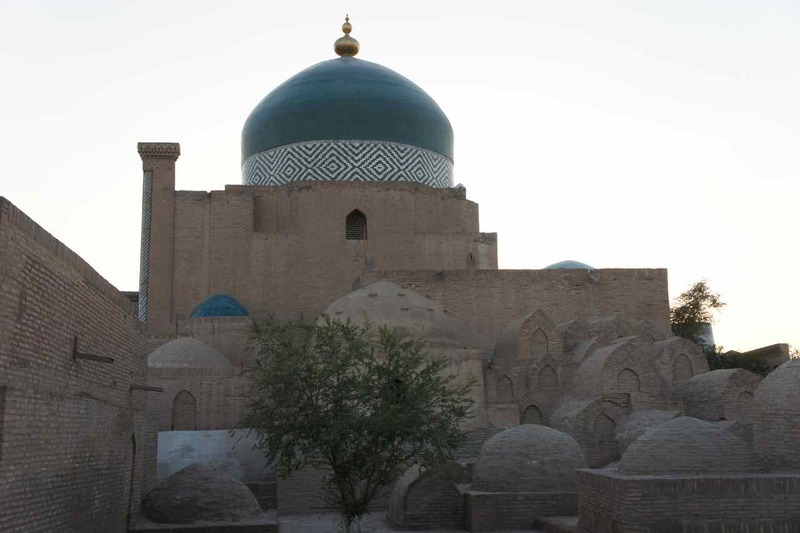 We arrived to Samarkand late last Friday with the intention to stay two or three days. The first day was planned to be a pure rest day while the others were planned for sightseeing. 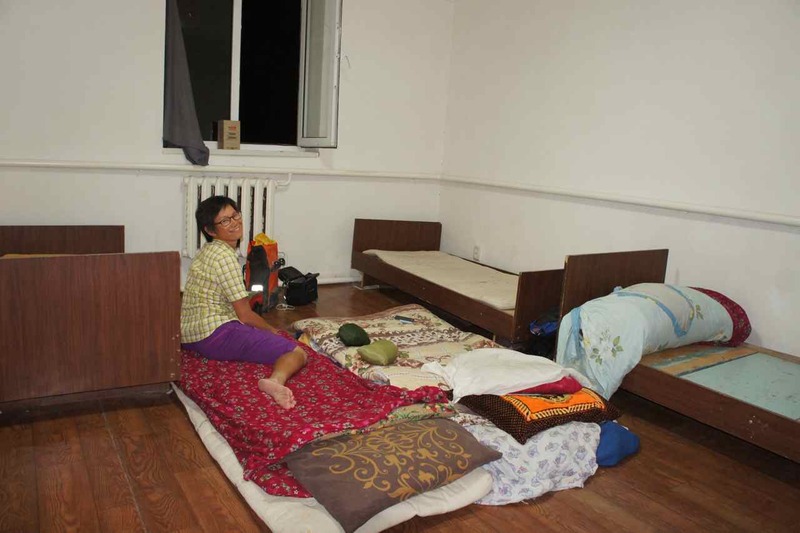 However, things did not turn out the way we planned to and we have spent most of the time here resting at the guesthouse which we now are just about to leave (Wednesday morning). Uzbekistan has a size and shape very similar to Sweden. We will travel across from the very west end to the very east end which is almost exactly 2000 km. We have a 30 days visa and that is enough to travel 2000 km at a convenient speed and also have timeto stop and visit cities. 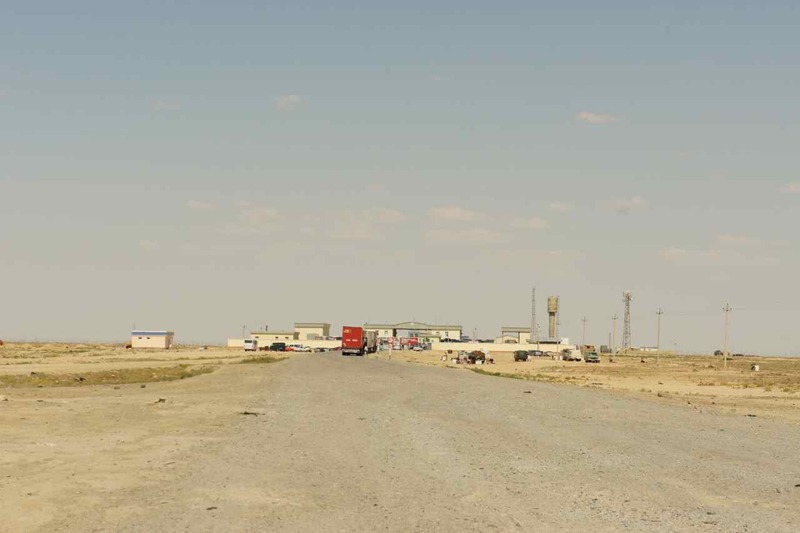 However, the requirement to register at least every third day at a hotel licensed to host foreign tourists has forced us to press really hard through some empty desert sections without any hotels and it is fair to say that the ride from the port in Kazakstan to here has been tough. The road has been long and very often of bad quality, the weather has been hot or extremely hot and the time pressure added to this has finally taken its toll. When we got here we were exhausted. 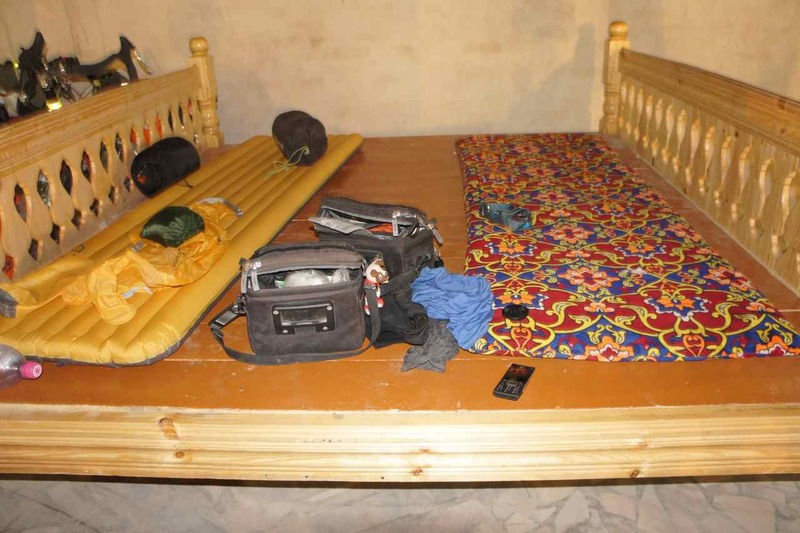 As I mentioned in a previous post the ususal rest day ache in my thighs got a lot worse in Bukhara and we were forced to take an extra rest day there. 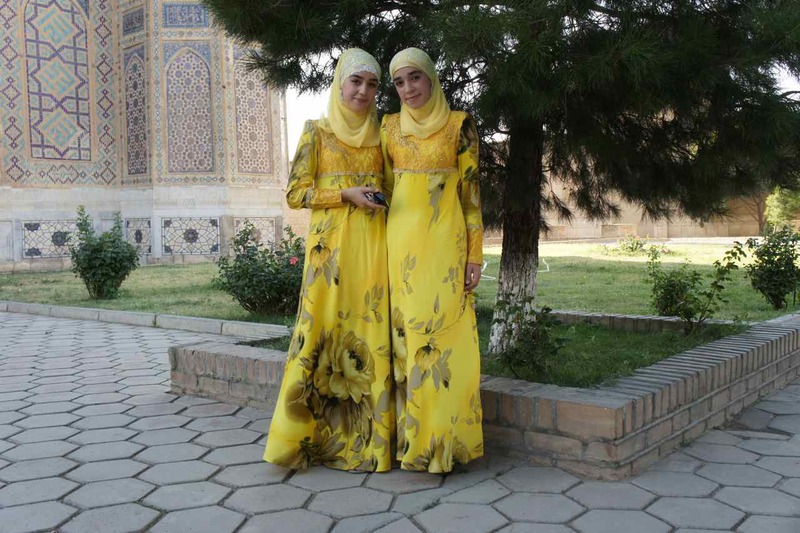 Here in Samarkand realitiy has in some way caught up with us and we have been sleeping most of the time. We planned to leave already yesterday, but in the morning my stomach was a bit upset and prevented us from leaving. It was just a short and not serious ordeal and it got better already around noon, but then I was too sleepy and powerless that I couldn’t even think of start pedalling again. To make things worse I managed to bump into the sharp corner of the bed in our room and now I have a bruise on my thigh that matches the colours of the ancient cupolas. We knew we have pressed hard and we expected reactions like these but they came a little bit too early. Kyrgizstan doesn’t require us to have a visa when entering the country and there are no obligations to register every few days. 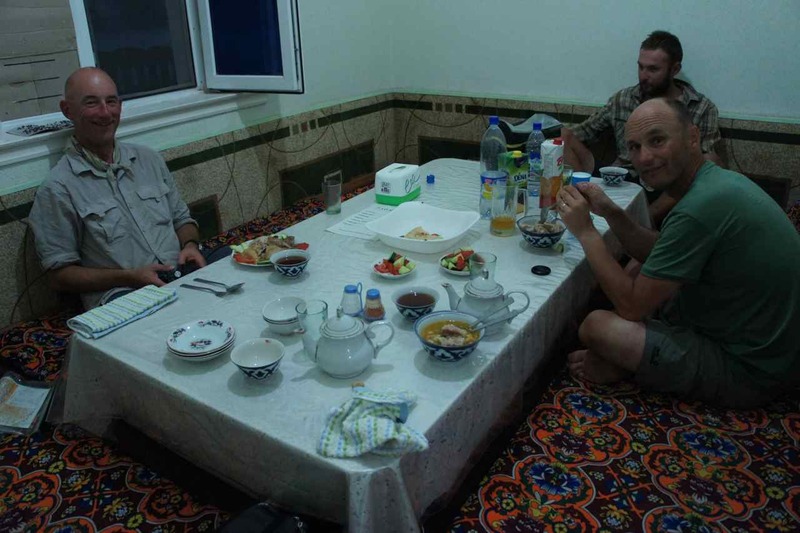 Our plan has therefore always been to stop for up to a week in Osh in Kyrgizstan to just rest, but we simply didn’t make it there and had to rest here instead. We are not the only ones who have run into these kind of problems. 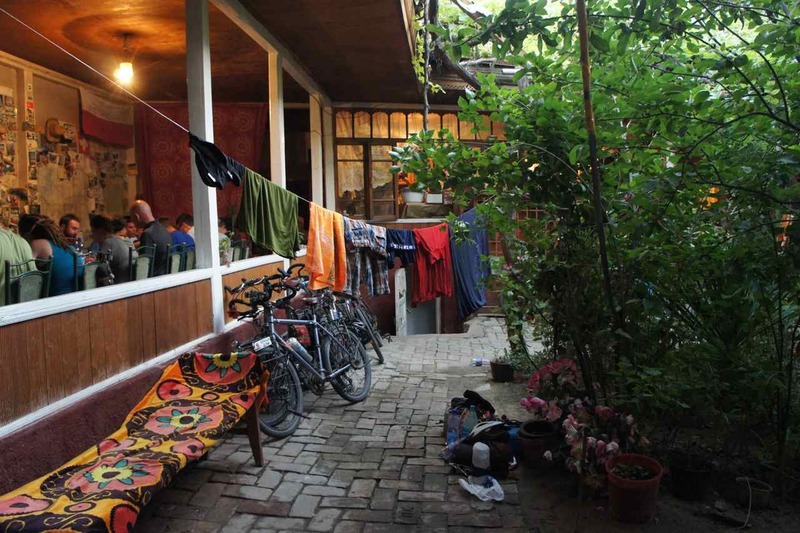 At the time of writing there are 11 cyclists at the hostel and three more left yesterday night so the cyclists are in majority and all are to a varying degree exhausted for the same reasons as us. All this means that we did a lot less of sightseeing than we had planned to. We haven’t entered many places, but just walking around in this amazing city can be enough. The architecture and all the old buildings are just magnificent. Please enjoy some of the photos below. 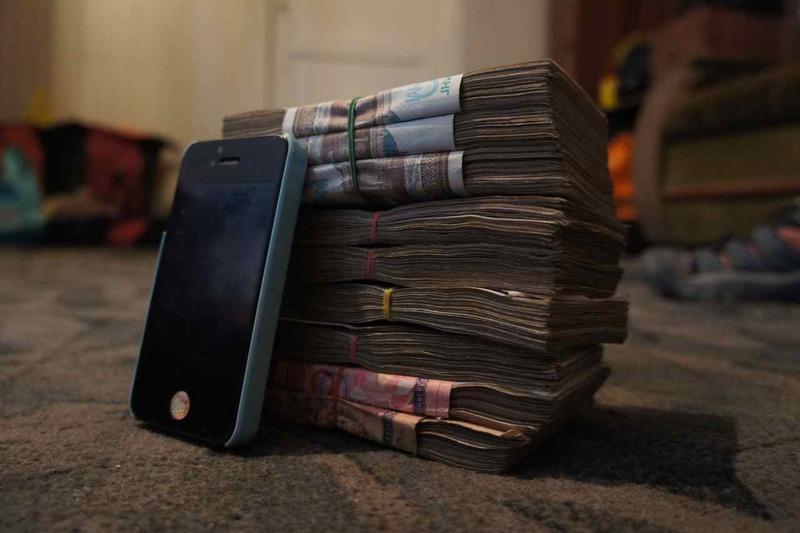 The registan. Unfortunately there was a stage for an upcoming music festival that blocked the view. This entry was posted in Posts in English on July 24, 2013 by admin. This entry was posted in Posts in Thai / โพสต์ภาษาไทย on July 23, 2013 by admin. 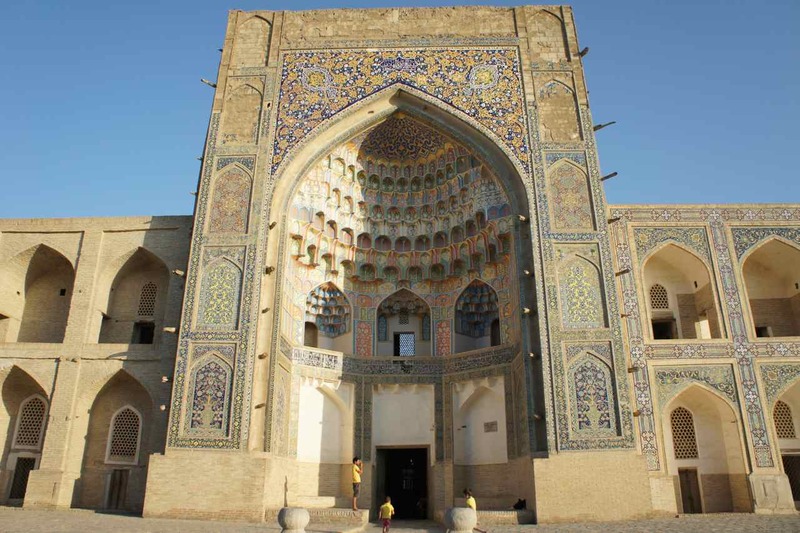 Our plan was to have to stay in Bukhara for two days for rest and sightseeing. On the afternoon before departure Wej and I went out for a walk and I once again suffered from a very peculiar muscle pain in my tighs. It is a pain that I started to feel about four months ago, only during rest days and only when walking really slowly. The strange thing is that it is an instant pain in both legs simultaneously and first time I can recall it happening was during the week we visited Sweden (april). It has only happened during restdays and only when walking slowly. First time it happened I stopped to do some stretching and then it went away. This feeling has then re-occured during restdays all the way, but it has only been a short pain and I have never suffered from it while cycling. 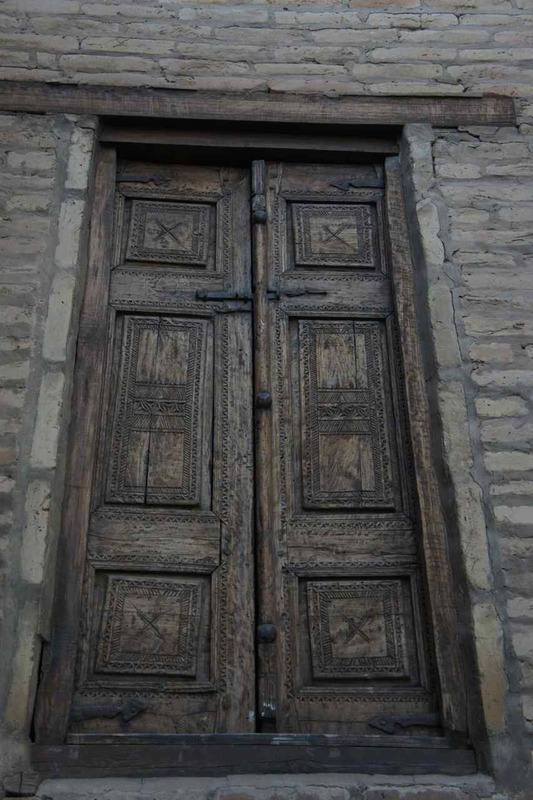 Wej and I went for a walk in the old town before leaving Bukhara and then it happened again. The pain was more intense and wouldn’t go away. When I woke up the following morning my legs were all stiff and I worried it would be hard to cycle. When in the saddle I immediately started to feel the pain that I had only felt when walking slowly. We tried to cycle a few kilometers, but then I decided to return and rest one more day. Back at the guesthouse I contacted friends back home who are doctor and physiotherapist. They both thought it was some sort of over exhaustion and told me to rest and maybe eat som anti imflammatory medicine. 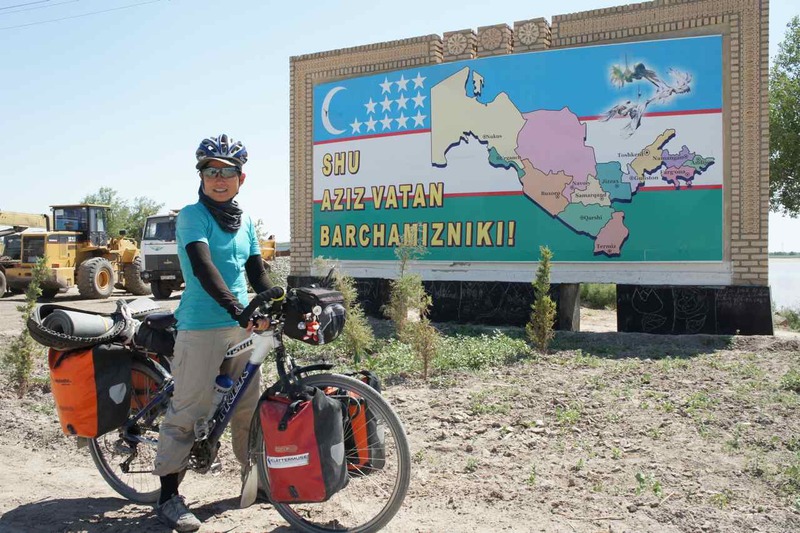 I did that and the following morning I felt good and we could start our ride towards Samarkand. This meant that we were one day behind schedule. 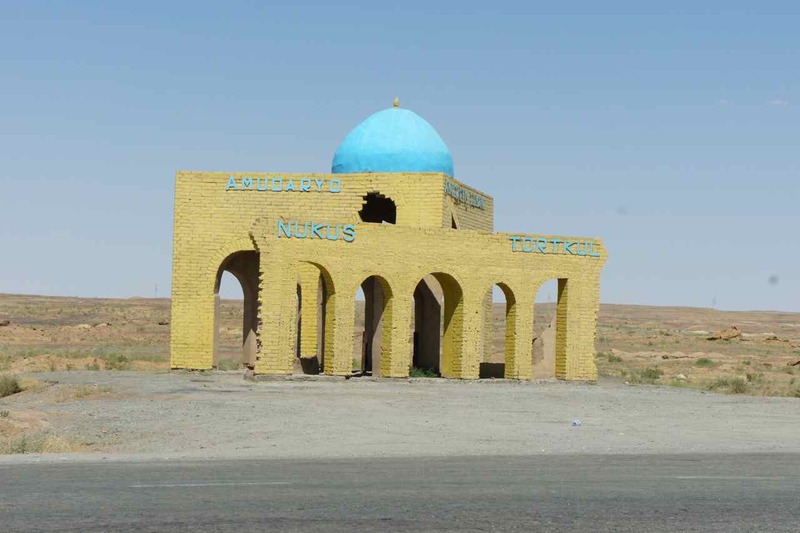 Although we only saw one sign showing the way to Samarkand it wasn’t hard at all to find the way out of Bukhara. The area around the city is very green and there are villages and towns all the way. Wej and I decided to stop after two hours of cycling to have a cup of coffe and some kefir at a restaurant. We were offered bread too, but we are by now so sick of the bread here that we didn’t want any. After a 2-3 hours we saw our german friend Simon enjoying a short break in the shade of a tree outside a little shop. 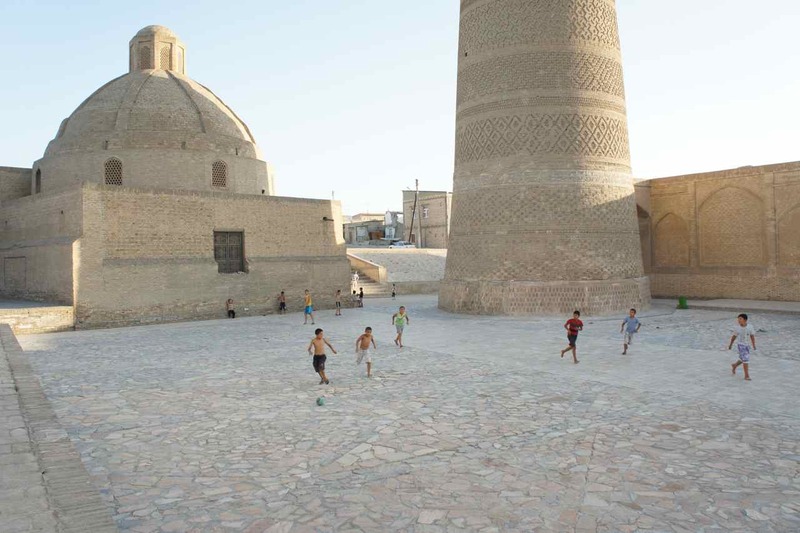 Our group had split in Bukhara, but since we were all going in the same direction it was very plausible we would meet again. We rode together for a while and then split again when Wej and I stopped for some reason I can’t remember. After 60 km the greenery ended abruptly and was replaced by desert. The road made a sharp turn and we got a strong headwind straight into our faces. It was the start of a tough part of the day, but soon we got some relief. A few kilometers into the desert we were overtaken by a Landrover with lots of stickers, jerrycans on the roof and other signs of being a ”round-the-world-car”. We have seen cars like this many times, but this one stopped 100 meters in front of us. The car was driven by a french couple on the way to Australia and then maybe south america. They gave us lots of cold water from their fridge and they were very curious about our trip. Being cyclists themselves they suggested that we should come and visit them in their village in the Pyrenees some time. They even said that we were welcome to use their house even if they still were traveling. What a marvelous offer – we will definately try to go and visit them some time, but then with our roadbikes instead of the heavy bikes we now ride. We lost sight of Simon just before the desert but after fighting for two hours in the dry headwind we found him taking a break at a cafe / hotel at Navois airport. 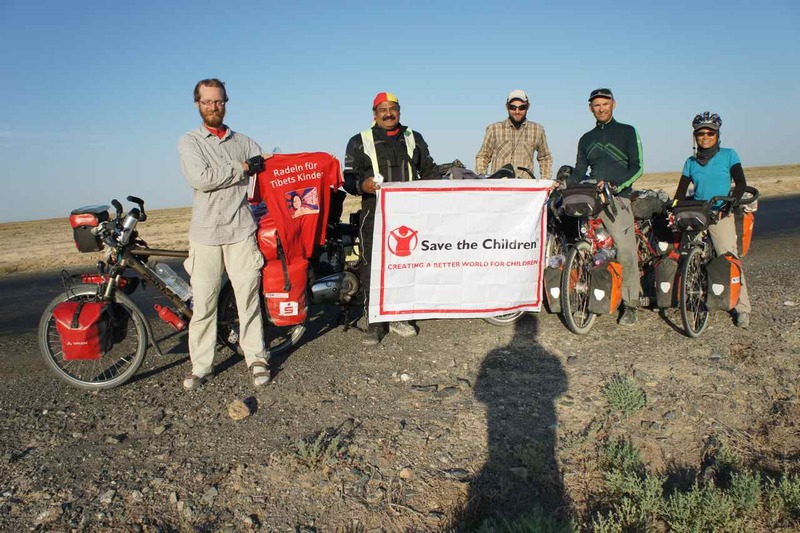 We were also very exhausted, the headwind was strong and it was terribly hot so we decided to take a break there too. After one and a half hour the headwind ceased and we could go on cycling. Simon and we decided to continue together and in order to make it to Samarkand the day after we needed to make at least 30 more kilometers. 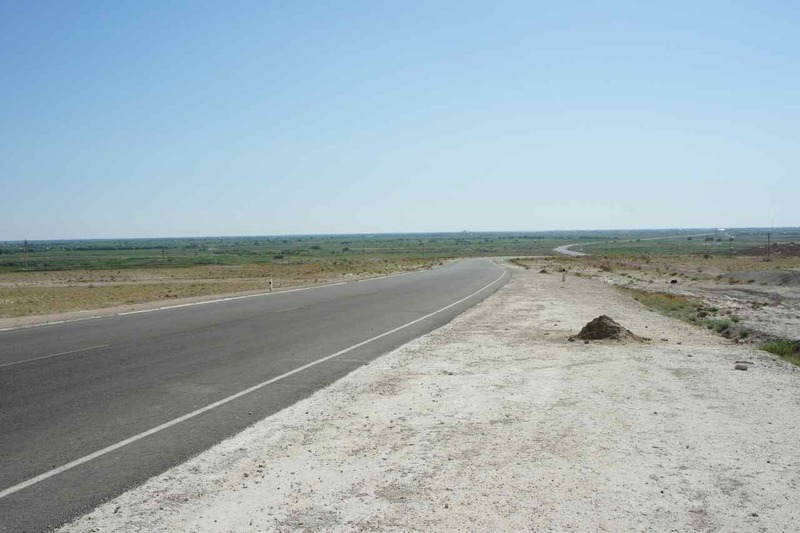 With a good road and without any wind we quickly got to the city of Navoi. Since the area is densely populated we didn’t have any big hopes of finding any good spot to camp so we hoped we would find some tea house somewhere. 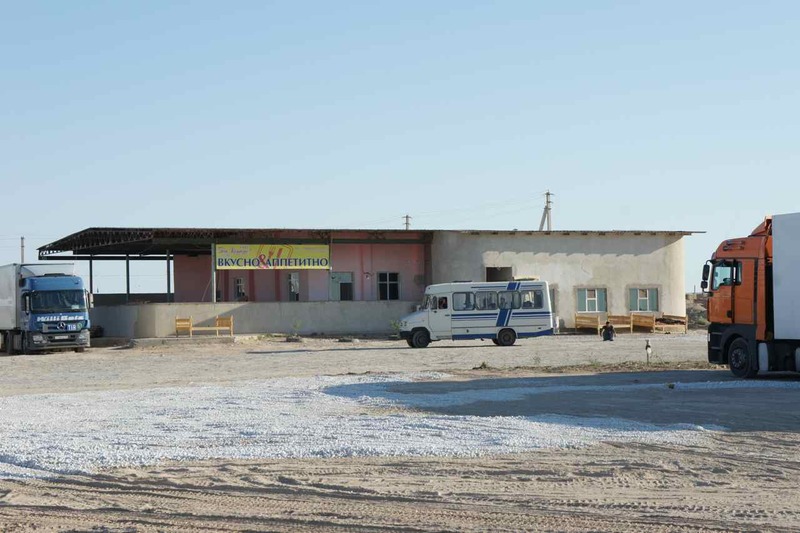 After passing through Navoi we found a TIR-park which is effectively a truck stop. We went in to ask if we could stay there and of course we were welcome. They served us tea and offered us to shower. Simon found a bench outside where he could sleep while Wej and I paid 5 dollars to sleep in a room. 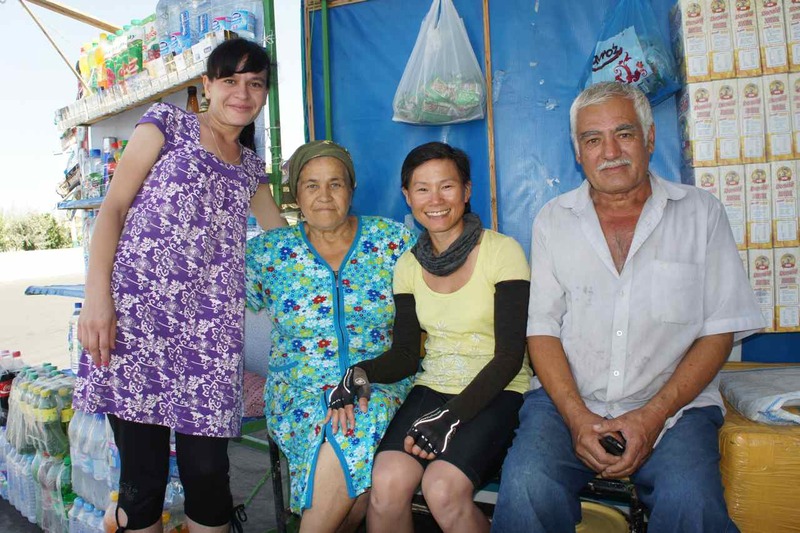 At the TIR-park we met an Uzbek truck driver who drives his truck between Uzbekistan and Poland and Germany. He told us it takes 6 days to drive to Poland and 7 to Berlin and then the same time back home again. I don’t envy him driving on poor roads and passing many time consuming borders. We usually go to bed rather early to be able to wake up at 5 AM and there were not many trucks at the TIR-park when we went to bed, but there were lots of them when we woke up. Many of the trucks are obviously bought second hand from Germany since they have logos from German companies. They don’t look old and worn out as one could suspect, instead they look to be in good condition. A lot of the trucks at this TIR-park and the ones we meet along the road are Volvo and Scania trucks. Every time I see a Volvo truck I think that maybe that specific truck was produced at the factory back in Göteborg. When seeing all those Swedish made trucks it is easy to understand why these two companies have such a major importance for the Swedish industry. 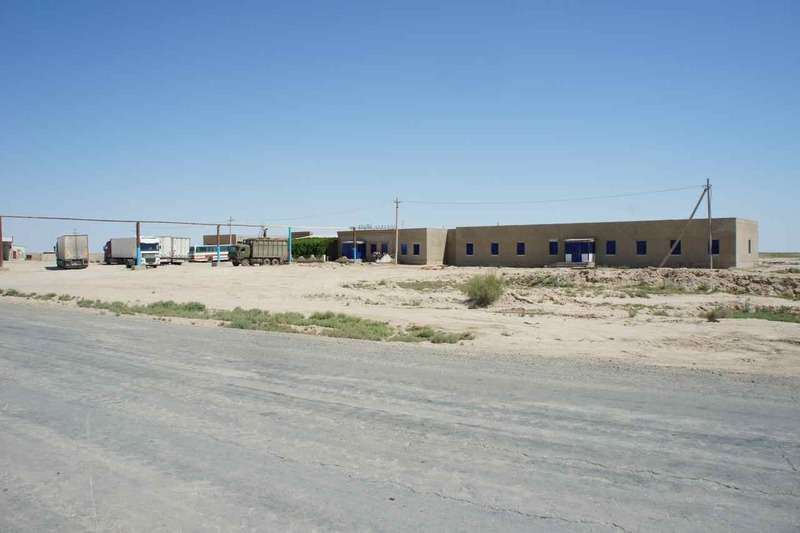 Land locked countries have difficulties developing an export based economy and Uzbekistan is one of the two double land locked countries in the world (the other one is Lichtenstein) so it must be very complicated to set up an export industry here. 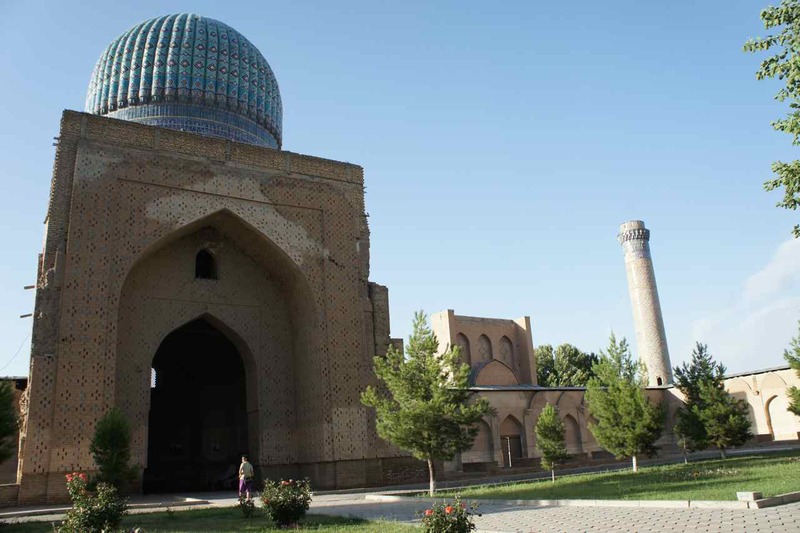 It was a little more than 150 km from the TIR-park we stayed to the center of Samarkand so we woke up at 5 AM the following morning in order to get as far as possible before the midday heat. There was hardly any wind at all and the road was good so we made good progress during the early hours. The wind picked up around 10 AM and it started to get hot and at noon we had only cycled 80 km when we decided to take a short cut. It was maybe a shortcut, but the quality of the road was so poor that it was impossible to ride at normal speed. We soon understood that we would bike 30-50 km at slow speed through nothingness and when we at came to a hill top with green trees we decided to stop. This little hill was like an oasis and somewhere there was a well because water was flowing from a pipe into a ditch. We decided to stop on the hill and bought a melon from a roadside vendor. This truck with a very long load stopped and the driver came out to fetch water to throw over the engine to cool it down. It was interesting to observe the well. Bypassers stopped to fill water bottles. Overheated trucks stopped and their drivers fetched waters with buckets and threw it onto their engines to cool them down. 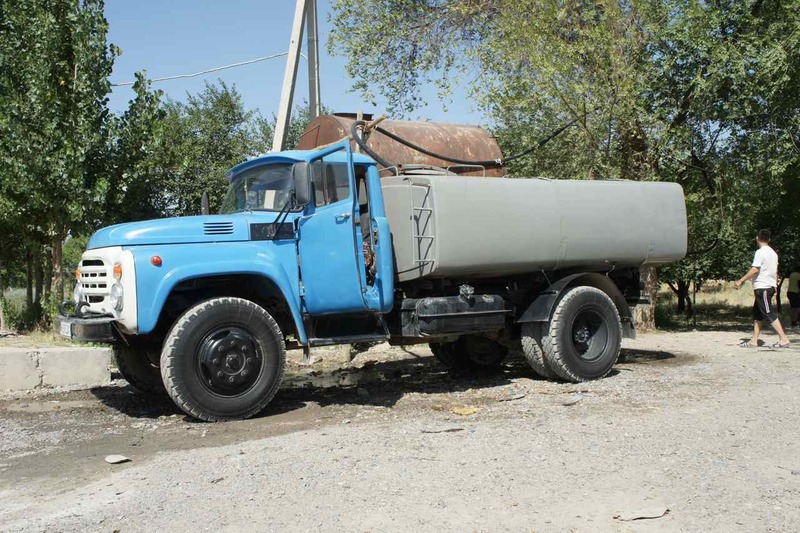 A couple of times tank trucks came to fill their huge tanks and transport the water somewhere else. They simply drove under the pipe and let all the water flow into the tank and anyone who wanted water while they were filling had to open a valve at the rear of the truck and fill the bottles from the truck instead of from the pipe. 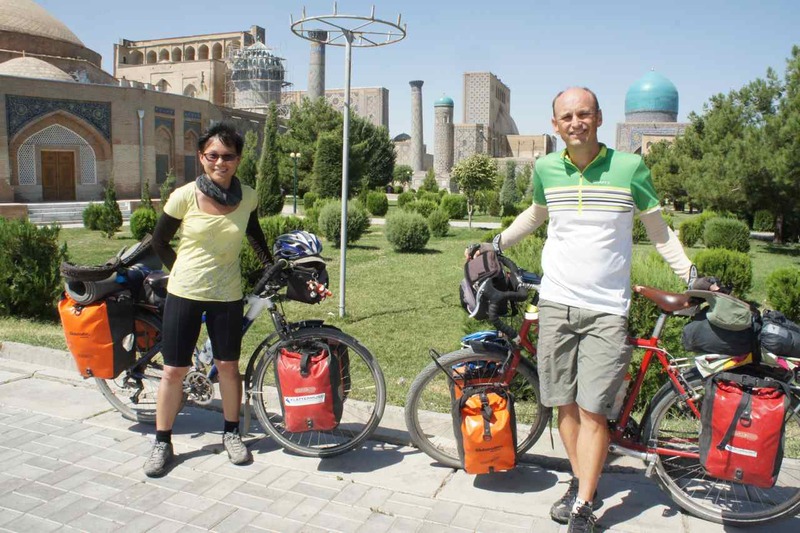 The heat turned into a more bearable temperature in the late afternoon and we started to bike the remaining 65 km into Samarkand. Beyond our oasis hill the road got even worse and there were endless hills. 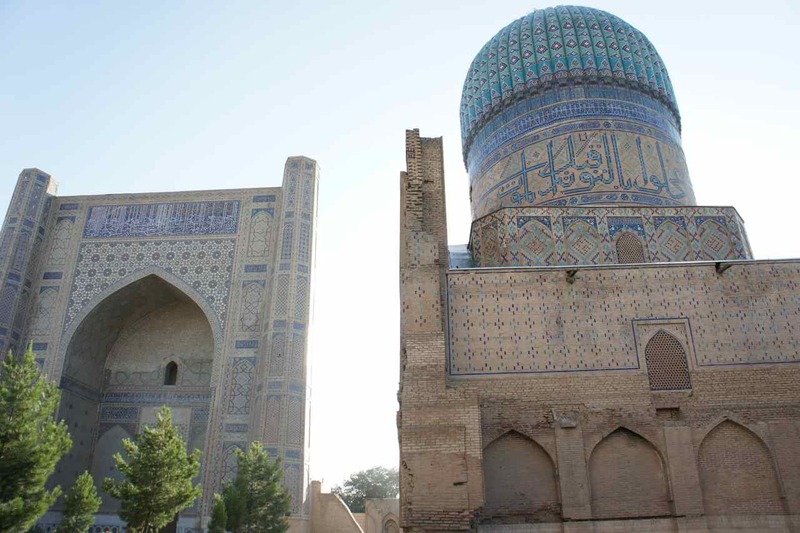 I started to suspect that unless the road got better we would never be able to get to Samarkand that day. 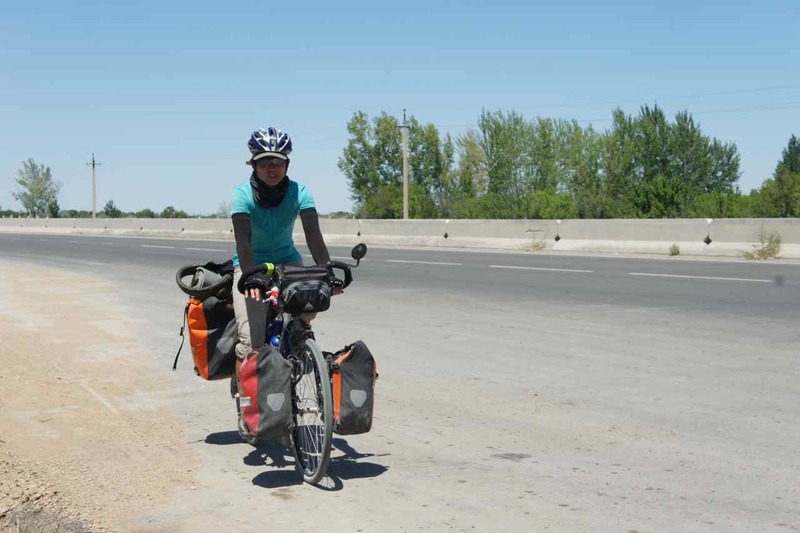 Fortunately the road got better and the headwind ceased too, so we managed to reach Samarkand just before darkness. 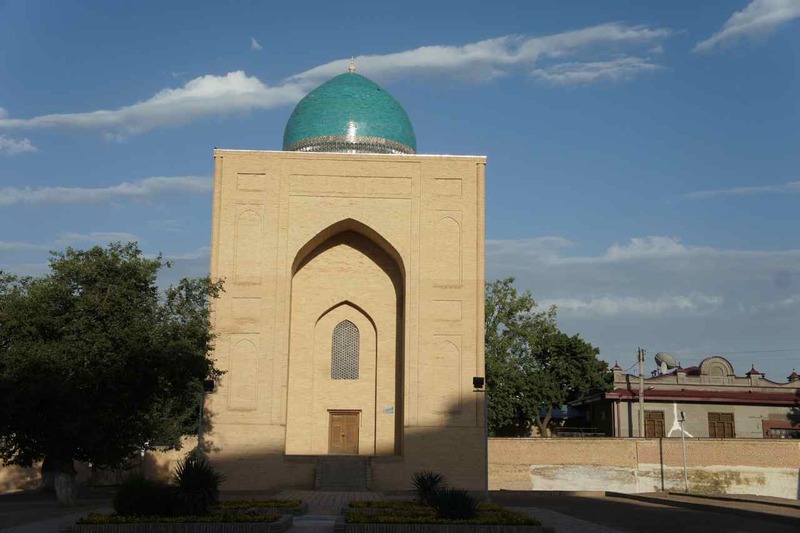 It was a long hard day, but just as in the wellknown Swedish song we reached to Samarkand that day. This entry was posted in Posts in English on July 22, 2013 by admin. On April 10th we opened a new standard size (160 gram) tube of Sensodyne toothpaste. We didn’t know how long it would last and we thought it would be fun to let the followers of our blog guess. The award for the the best guess would be a postcard from the town where the tube finally got empty. We got a number of predictions and first to drop out was Iain who guessed Samsun in Turkey. Then we passed a number of locations where our readers had guessed we would run out of toothpaste. We have discussed among ourselves who we thought would be the lucky winner and if there would be any postcards for sale there. 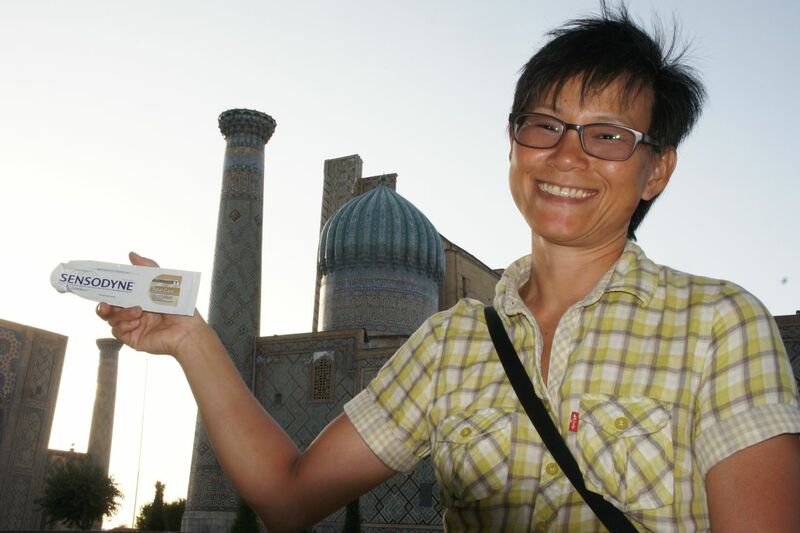 This problem is now solved since we today ran out of toothpaste in Uzbekistan’s most touristy town which is…. 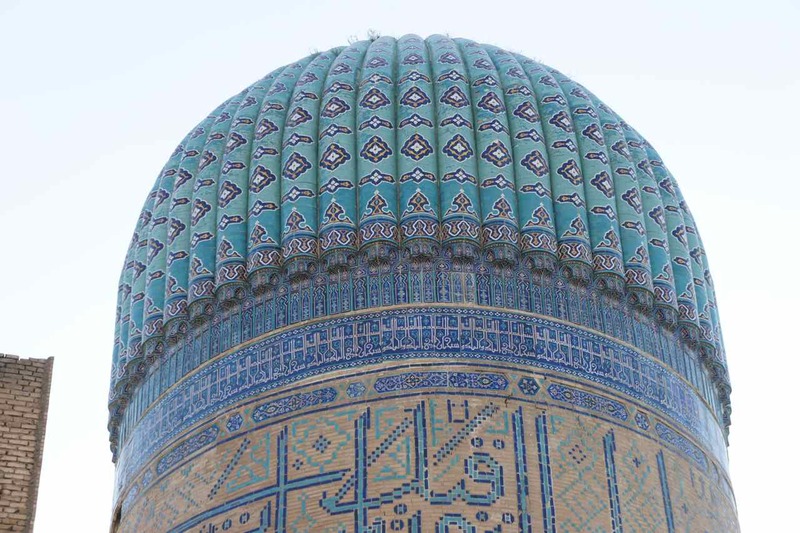 There were a few guesses in Uzbekistan and around but there was one guess that was spot on and that was made by Ryszard from Chelmno who predicted we would finish the tube in Samarkand. Wej and Ryzsard outside the hotel where we stayed and where he works. We would like to congratulate Ryszard and the rest of the Chelmno fan club for making such a spot on guess and we ask you to quickly send an e-mail with your address so that we can send the postcard to you tomorrow. จนกระทั่งเราคุยกันเองว่าถ้ายาสีฟันหลอดนี้หมดที่ไหน เราจะหาซื้อโปสการ์ดที่เมืองนั้นได้หรือไม่ เพราะแต่ละที่ที่เราปั่นผ่าน ในช่วง 3-4 อาทิตย์ที่ผ่านมา เราอยู่ในทุ่งทะเลทรายหรือไม่ก็ตามชนบทนอกเมือง แต่ไม่มีปัญหาแล้วค่ะ เพราะยาสีฟันหลอดนี้มาหมดที่เมืองที่มีนักท่องเที่ยวมาจากทั่วทุกมุมโลกที่ประเทศอุซเบกิสถาน และสถานที่นั่นก็คือ….. 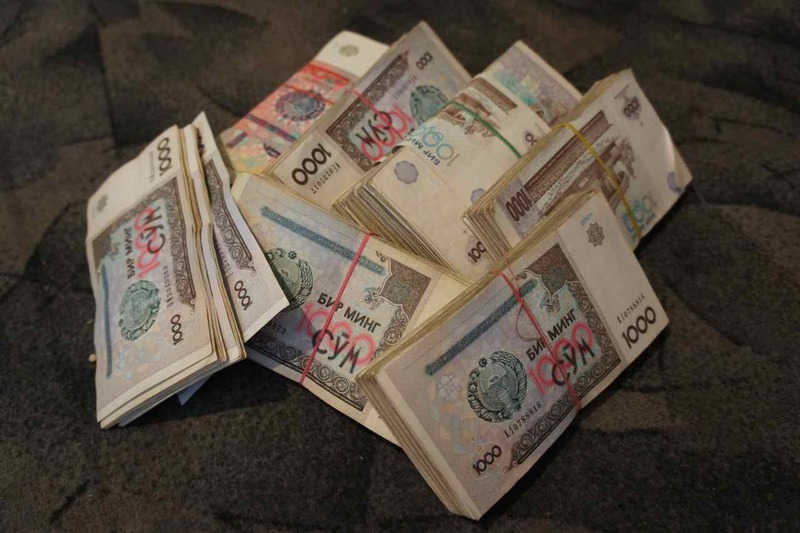 This entry was posted in Posts in English, Posts in Thai / โพสต์ภาษาไทย on July 21, 2013 by admin. 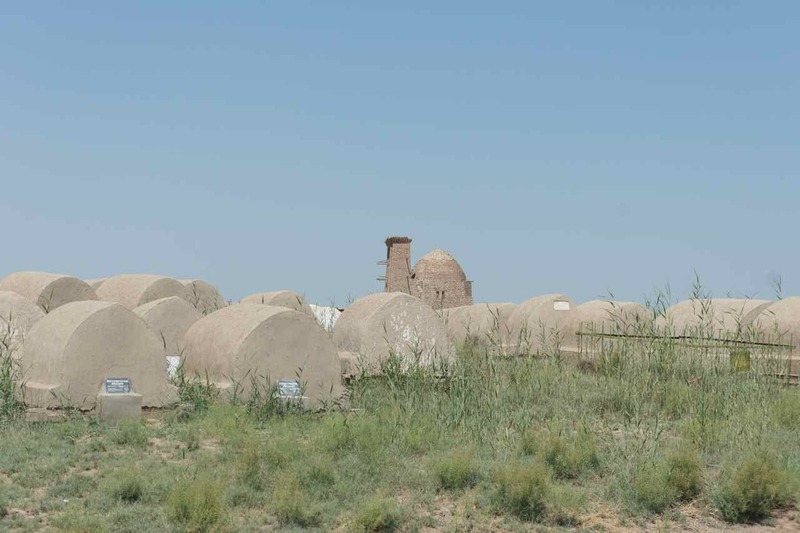 We have been on the classic trade route called the silk road for some time now, but it isn’t until recently that we have got the feeling of really traveling on it. 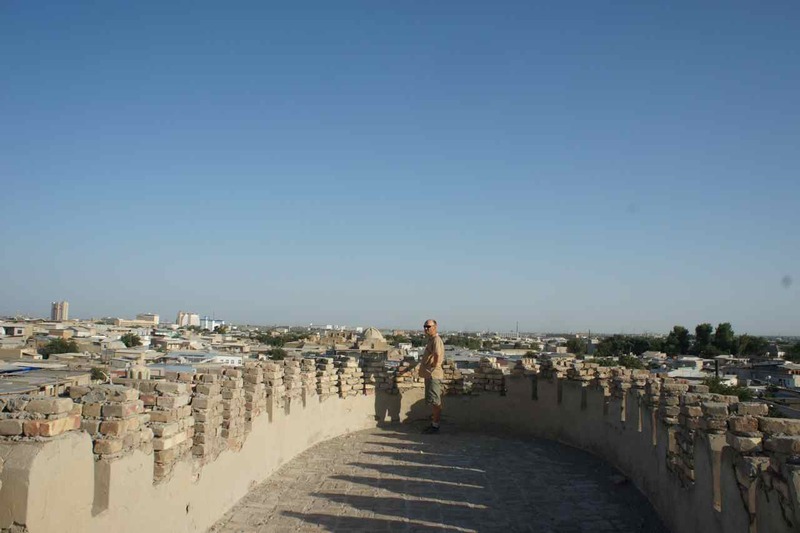 The magnificent buildings in the ancient cities of Khiva and Bukhara made me get a feeling of being present in the orient. Marvellous mosques and madrases covered in marble and mosaicwith blue cupolas that glitter in the sunset would make anyone get the feeling of being in ”Alladinland”. 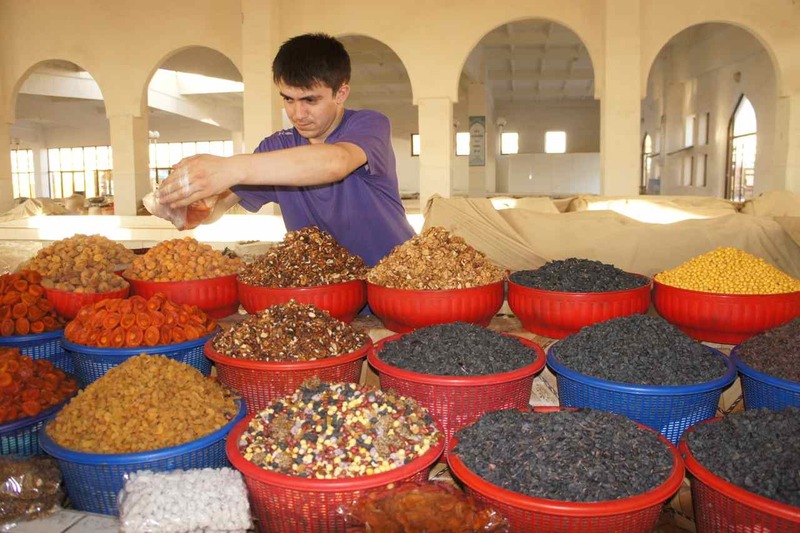 The Silk Road was the old trade route between China and Europe / North Africa and for centuries different sorts of goods was carried along it in caravans. 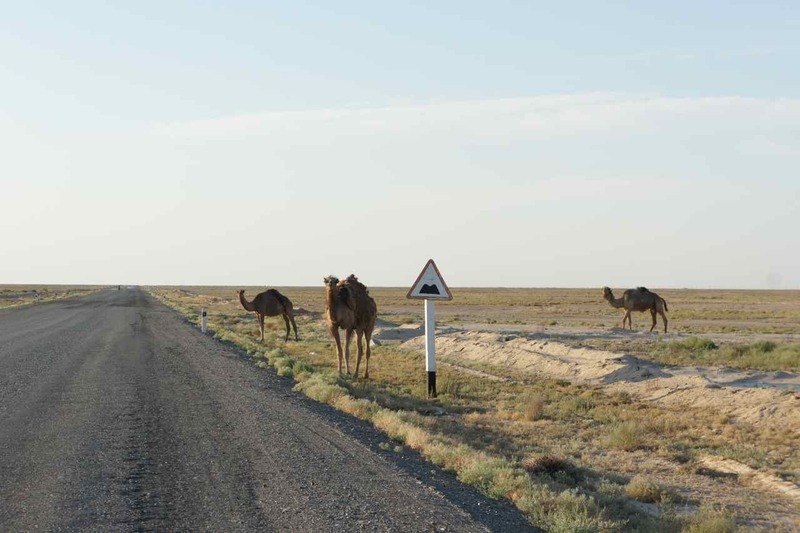 Today the trade along the Silk Road is still going strong, but the means of transportation is no longer camels, but trucks. We see quite a lot of them along the road as we ride on and many of those trucks have come from countries far away. Every day we see trucks from our baltic neighbours (Lativa and Lithuania), Belarus and sometimes even Poland. I admire those truck drivers who spend long time away from their families driving their trucks day after day on poor roads and across numerous country borders that I believe take a long time to get past. Everytime I see a truck from Latvia I get the feeling that the world isn’t that big at all – it feels like meeting someone from the neigbouring block when visiting a far away place. Talking about trucks. When we sat and had our breakfast at a Chaichana (tea house) a few days ago, we saw a truck approaching. 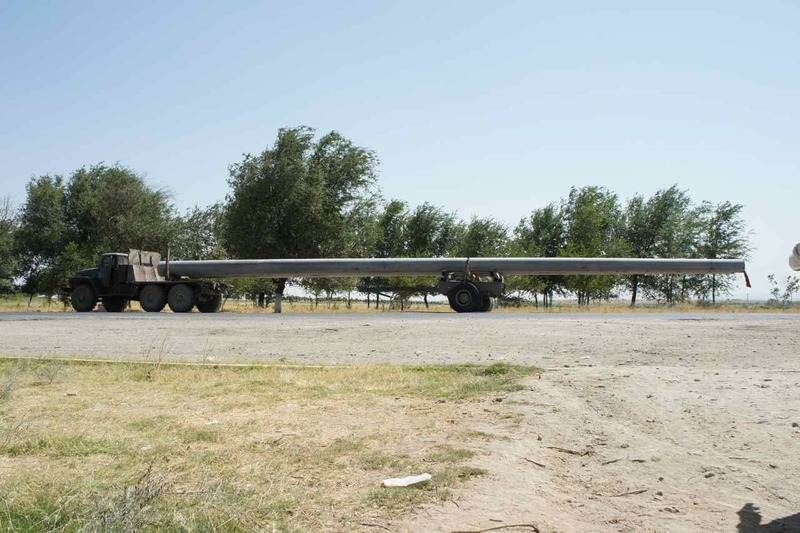 When it was close we saw that the trailer was carrying a load of a big wooden ship and none of us could understand why anyone would need a big wooden ship in the middle of the Uzbek desert. 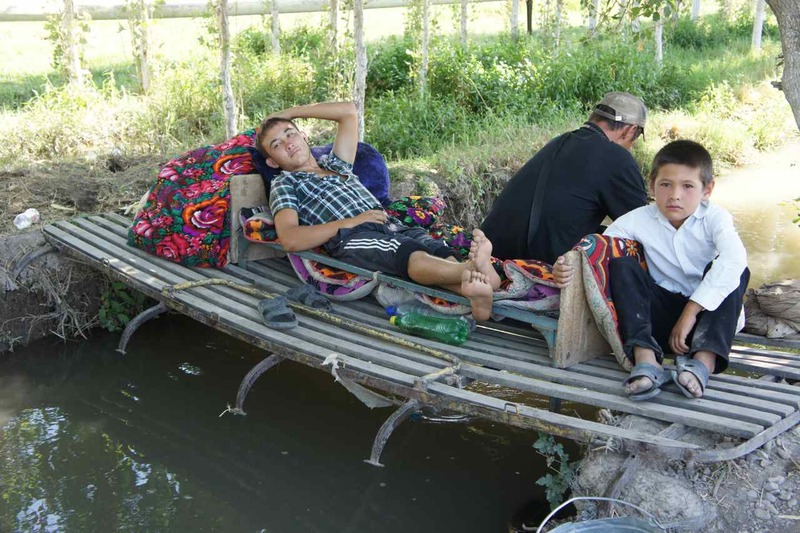 The owner of the tea house later told us they sometimes transport old ships like that from the Aral sea where it’s not needed anymore, to Tajikistan. 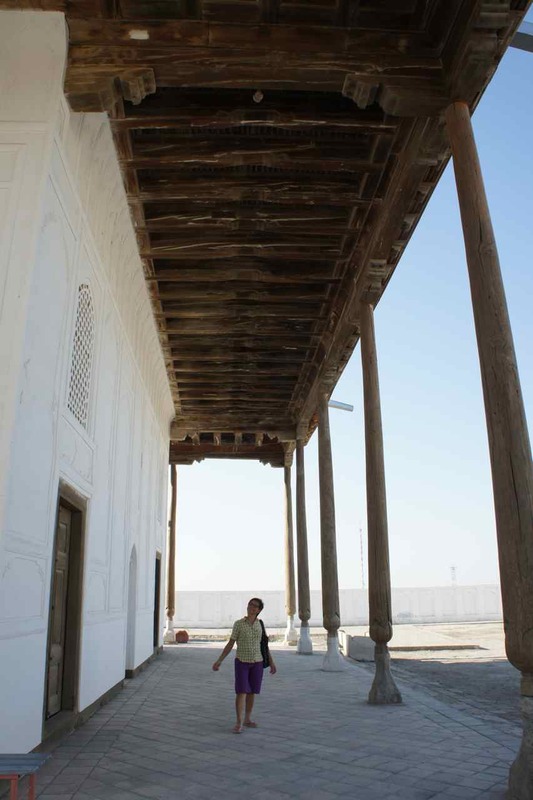 One can wonder where in Tajikistan they would have use for old wooden ships? Maybe they use them as firewood…. 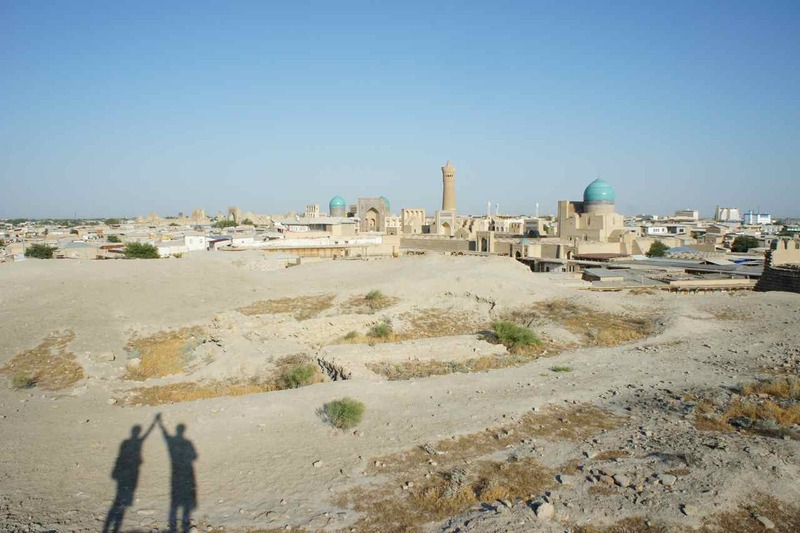 The landscape between Khiva and Bukhara consists of just another great desert. It isn’t too fun to cycle on such a flat landscape that when the road disappears it is because of the Earth’s curvature and not of any hill. This time the desert wasn’t so flat and there were small hills all the time and I appreciated to not have to see how the road disappeared below the horizon far away in front of us. 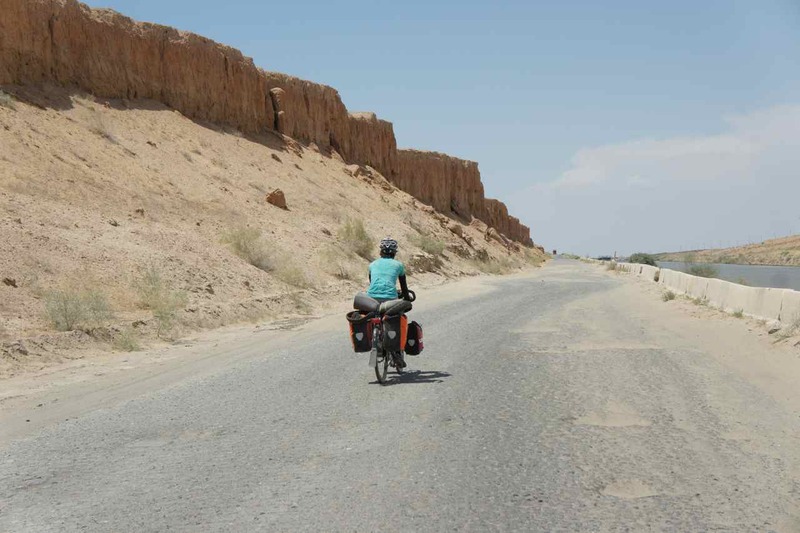 The first 70-80 km out of Khiva were more interesting since we rode on a small road in an area where there is water and hence green and populated. 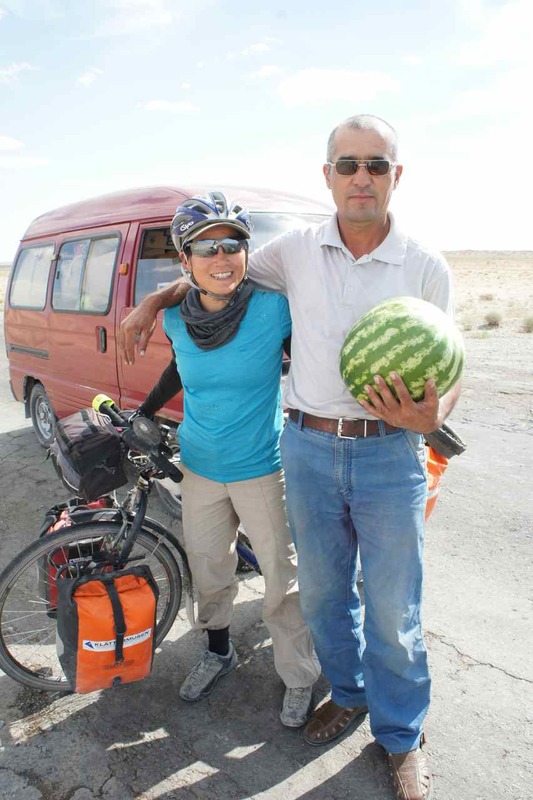 We stopped to have water melons before leaving the green area and heading into the desert. Since we still are a loosely connected group we tie a blue scarf along the road when we have stopped somewhere to show the friends who ride more slowly where to look for us. A flowerbed outside a tea house. 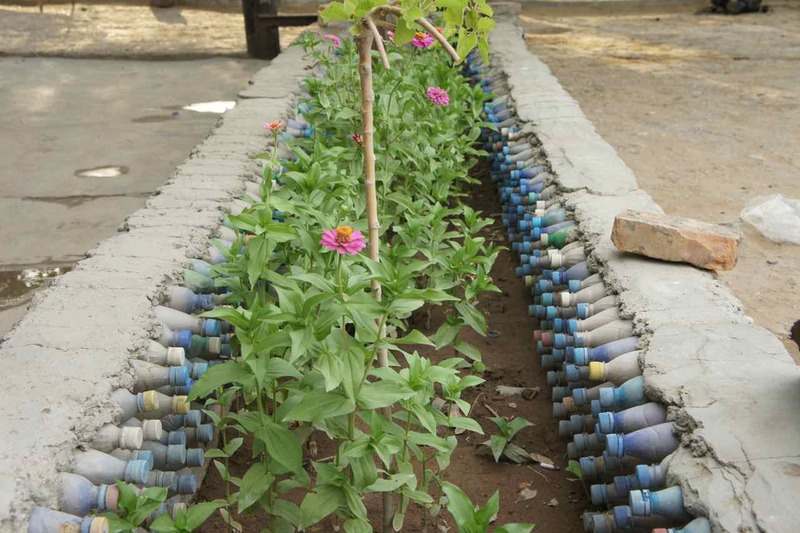 Note the surrounding wall made of water bottles filled with sand. 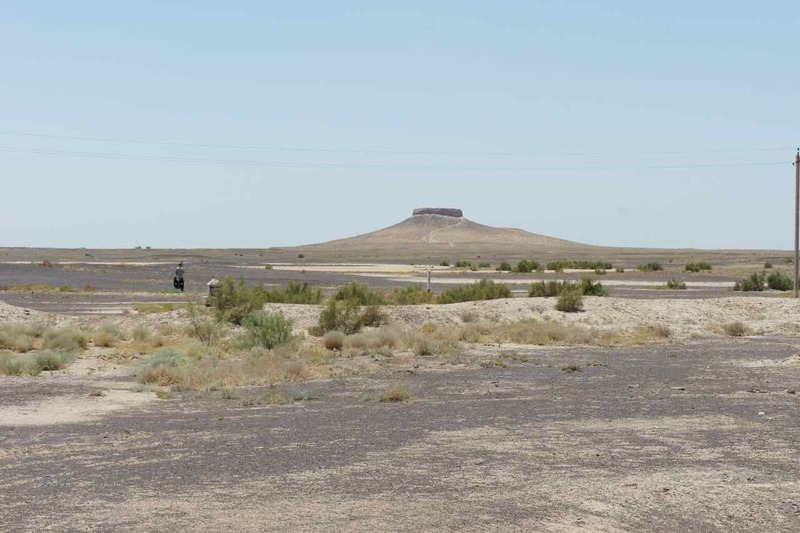 Eventhough there was greenery both around Khiva and Bukhara we still felt that this road was the section through the desert was the most boring road so far on this journey. The views were not interesting, the heat was intense and the road was mostly good. When the road is bad one has to concentrate on finding an ideal line and not riding into pot holes, but when the road is good one has time to sit and look at the boring landscape. I needed to muster all of my goal orientation capabilities to be able to ride this road, not because it was so hard but because it was so boring. 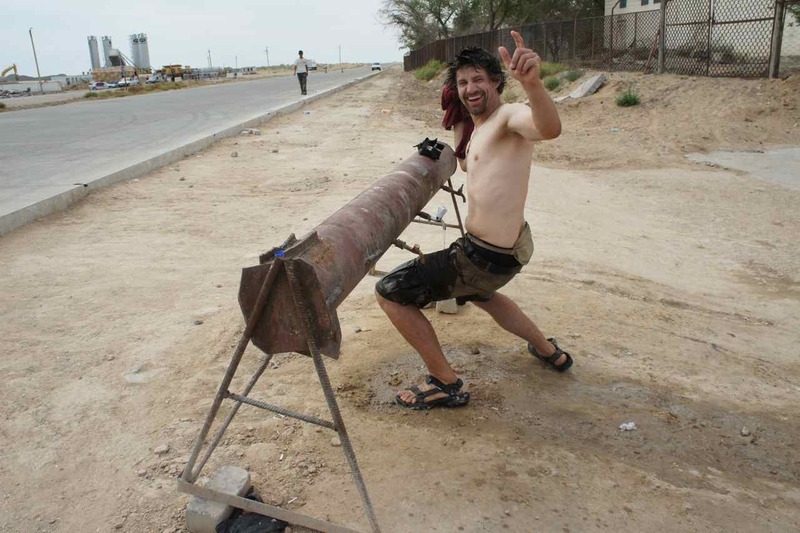 The weather in the desert is not only hot. One day it was very windy and the crosswind kept blowing sand into our faces and eyes. Eventhough the wind was slightly from behind it was so hard that it was difficult to cycle and when we saw a tea house after having cycled for 50 km we decided to make a long stop to wait for the wind to cease. Three hours later the wind was almost gone but when we prepared to start to cycle it started to rain. It was not a cold rain like back home and it didn’t last very long but we managed to get really wet. An amazing experience in the desert. 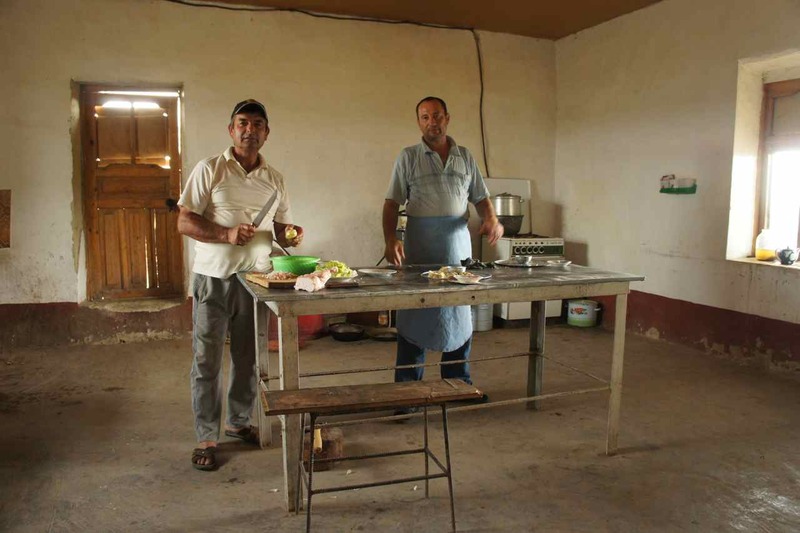 A tea house that specialized in fish dishes in the middle of the desert. Chaikanas (tea houses) are small restaurants where we stop to have a break and get something to eat. We had read that there would be a section of the road of more than 100 km without any tea houses but we didn’t really know exactly where. This led us to always carry a full load of water. 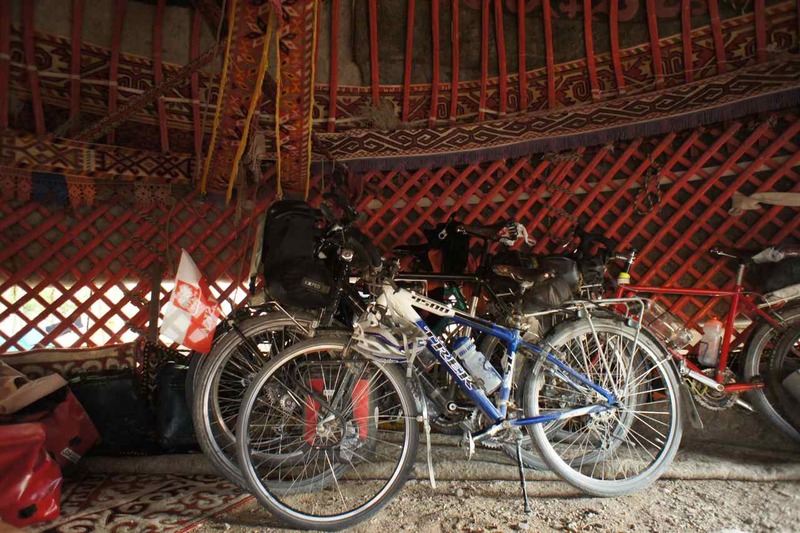 If anyone reads this who intend to ride between Khiva and Bukhara I can just tell you that there are tea houses every 20-40 km and there is no need to carry more water than is needed for half a day. 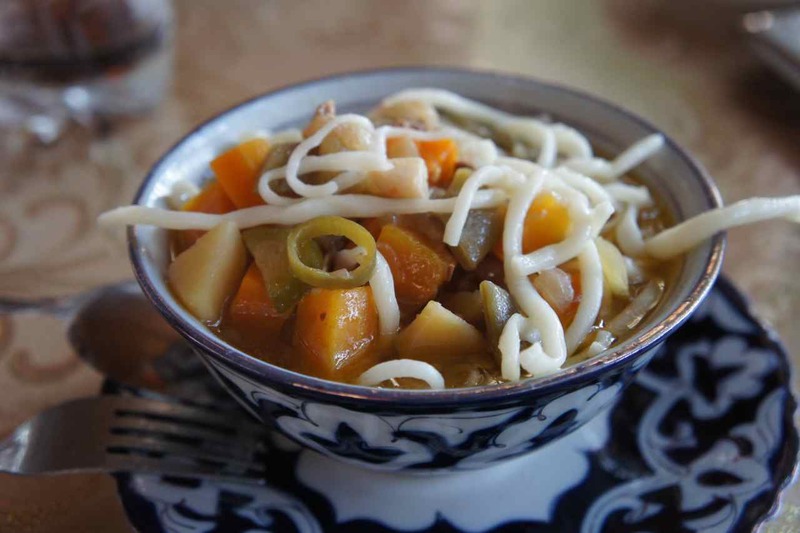 The tea houses are a very simple restaurant where travelers stop to drink tea and eat simple meals. The guests sit on platforms with a low table in the middle and there are platforms both inside the building and outside. It also seems that these tea houses are a popluar place for truckers to spend the night at. A couple of times we have asked if we can sleep at the tea houses and it has never been a problem. The staff just point at a platform where we can sleep. Sometimes other guests who drink vodka a few tables away have disturbed our sleep but for me that has not been a too big trouble. 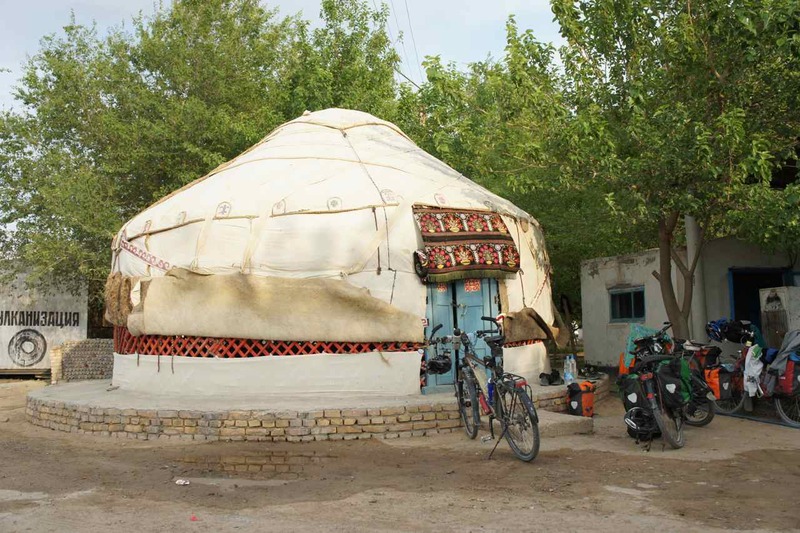 One afternoon when we arrived to a tea house we saw that they had a yurt in front of it. There were a lot of trees in the area and we saw water hoses on the ground. This led us to ask if we could stay in the yurt, which we could. Normally we don’t have to pay for the accomodation at the tea houses and only pay for the food, but at the yurt we had to pay the equivalent of 40 US Cents each. The yurt that would be our home for the night. Our German friend Simon has been dreaming of staying in a yurt for 15 years and now it was going to become true, and on a very special day for him. 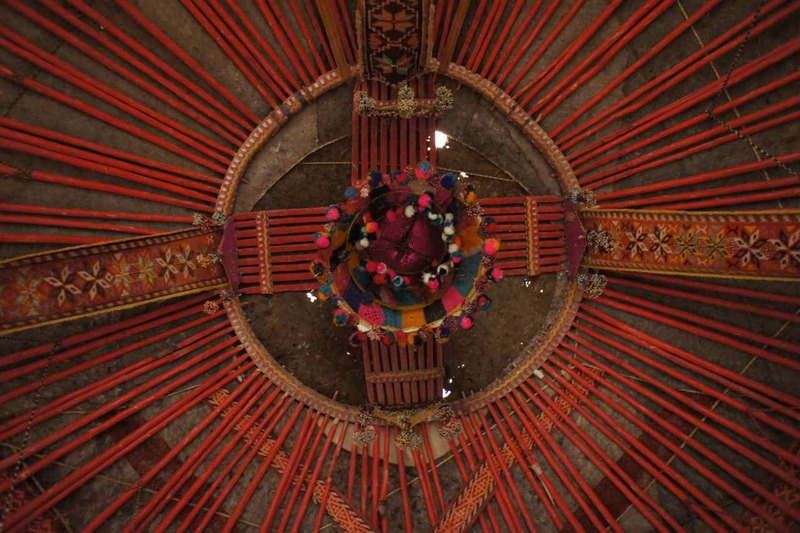 The following day was his birthday and he would wake up in a yurt – a perfect birthday present. 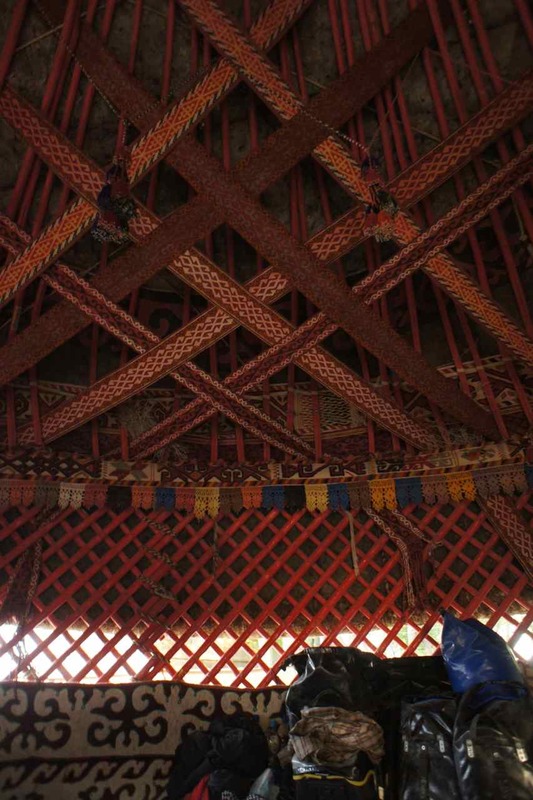 Having slept in yurt before I didn’t enjoy it in any particular way. What I enjoyed most with this tea house was the water hose. I went into the little garden beside and used the hose as a shower. It felt wonderful after a day of cycling with temperatures going as far up as 45 in the shade. 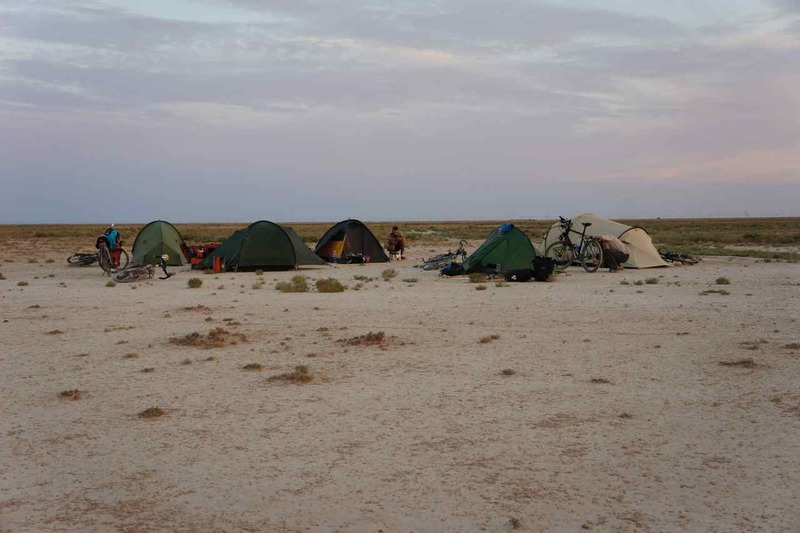 Our group is soon going to split and since it was Simon’s birthday we decided to camp in the desert and he invited us to his birthday party consisting of biscuits and two big bottles of beer. Not that we got drunk but it was a nice feeling to sit in the desert watching the clear sky with thousands of stars while having a beer and interesting conversations. 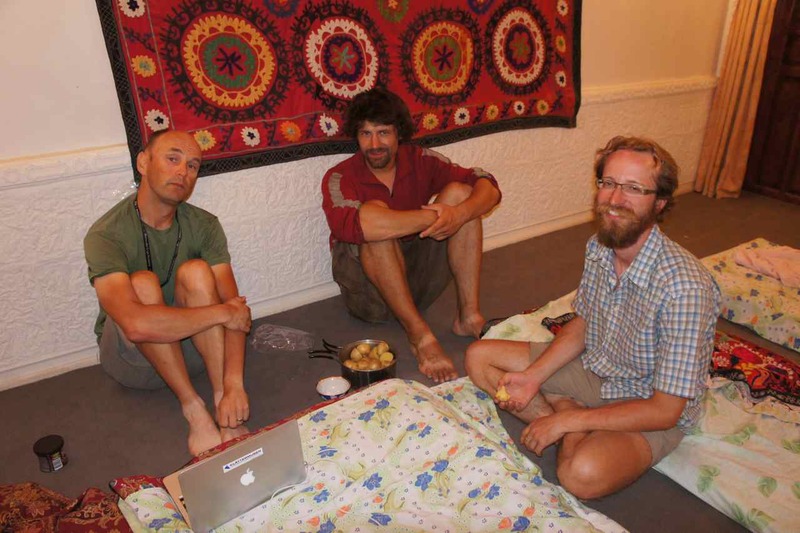 Enjoying boiled potatoes at the guest house. 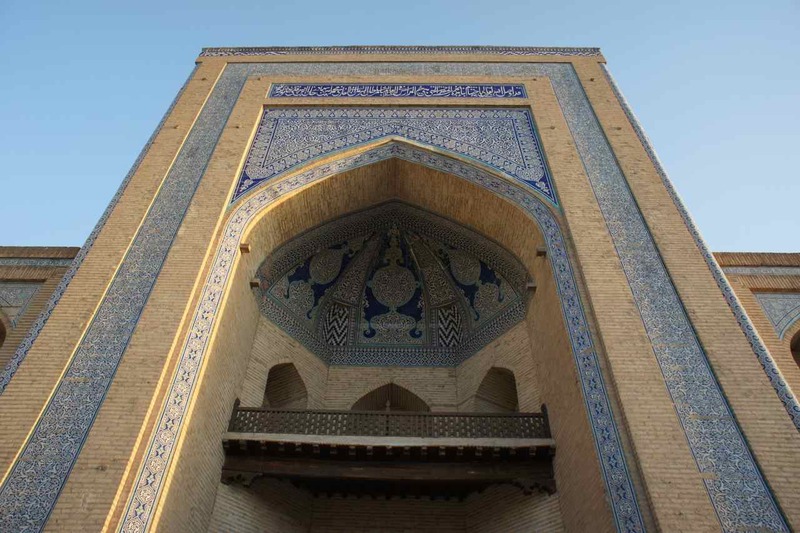 Bukhara is one of the classic cities along the Uzbek part of the Silk Road. We have spent some time just walking around admiring all the old beuatiful buildings. 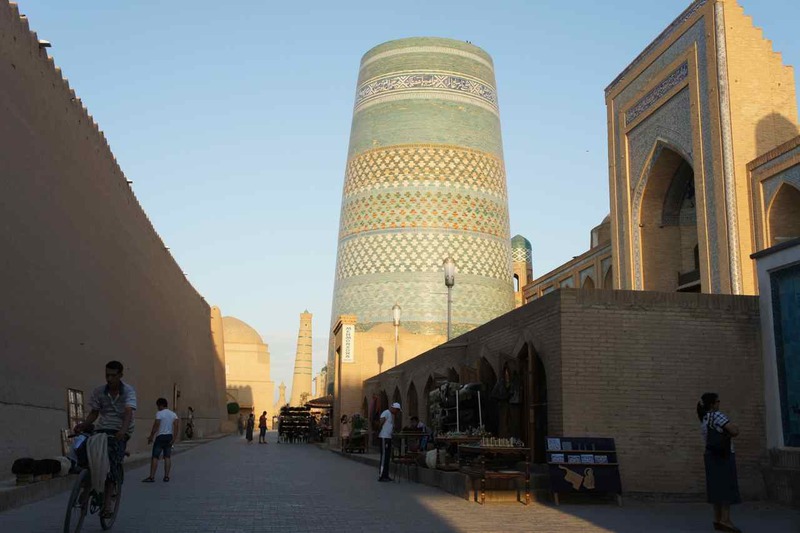 It doesn’t feel as over-renovated as in Khiva and the city feels more lively. One day we went up to the ”Ark” which was the former government palace located on a hill. 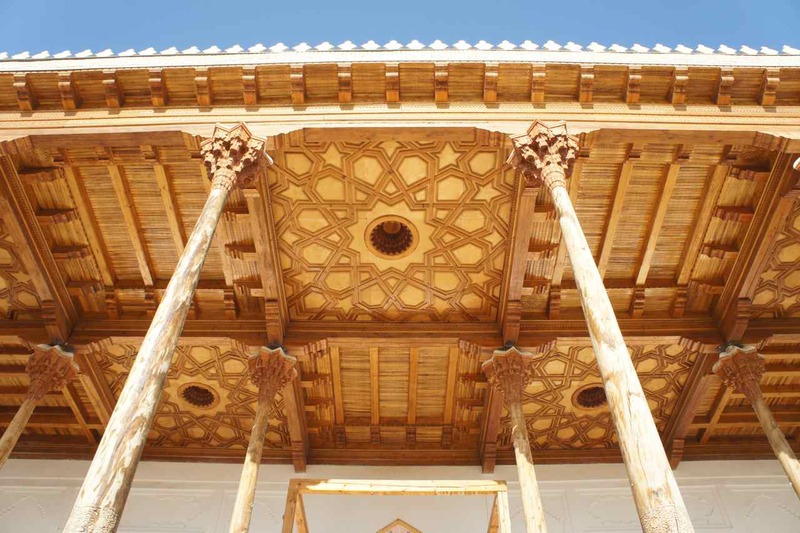 It is now a museum but only 20 % of the buildings in the 4 hectare palace area is still intact. 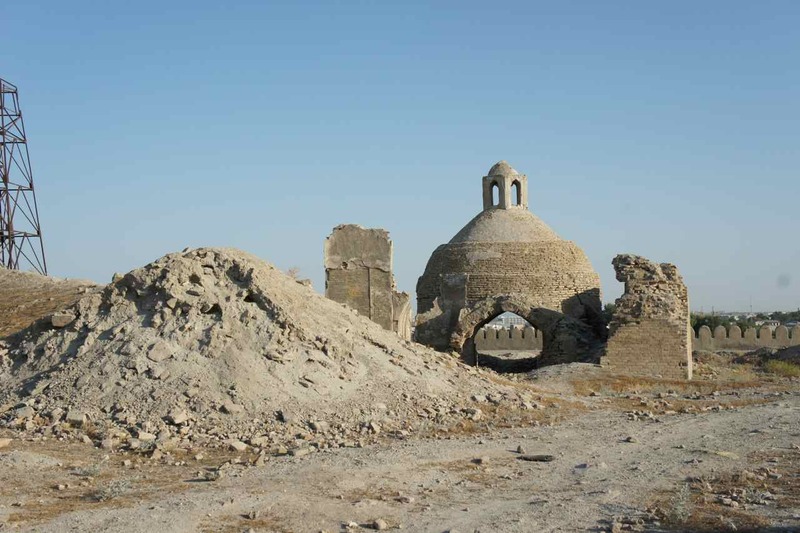 The remaining 80% is just rubble from when the Bolsheviks bombed the area in the 1920:s.
This entry was posted in Posts in English on July 17, 2013 by admin. This entry was posted in Posts in Thai / โพสต์ภาษาไทย on July 16, 2013 by admin. 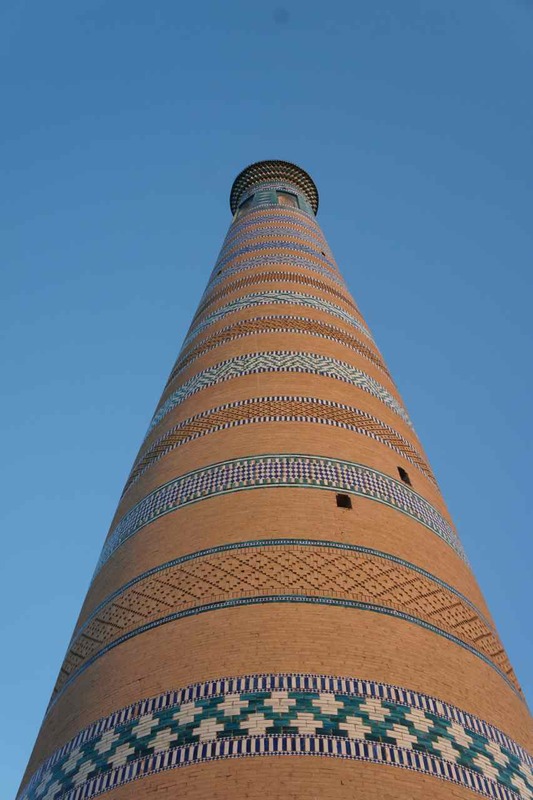 We are now in the ancient silk road city of Khiva in Uzbekistan. 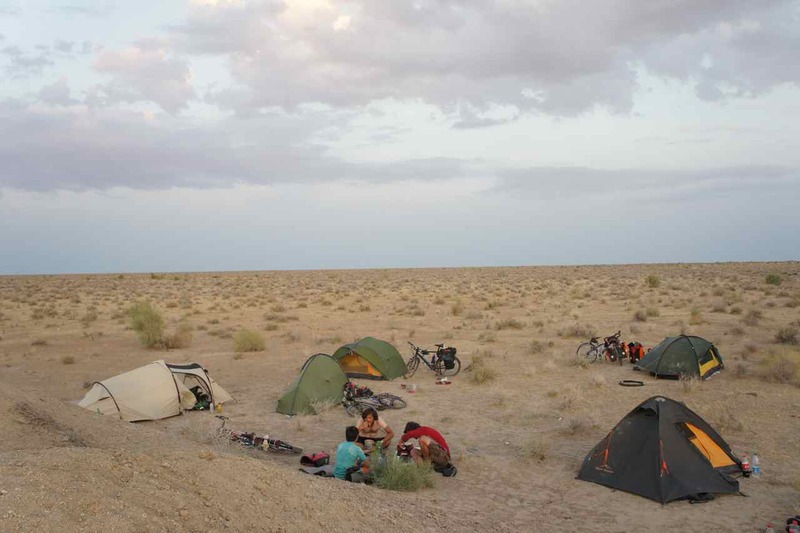 From the Aktau to the town of Beyneu in Kazakstan it was 500 km cycling thorugh the desert and from Beyneu to Khiva it has been another 700 km mainly through desert. We have passed some small town and villages on our way here. 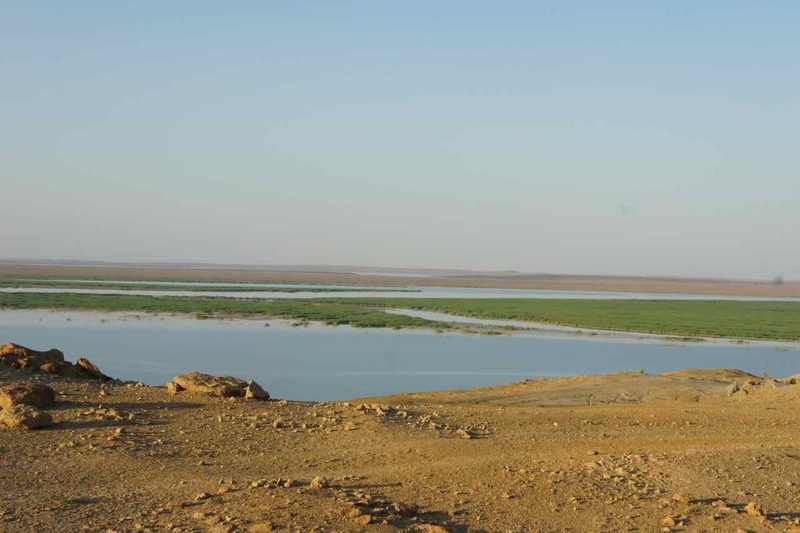 Some of them have been in the middle of the desert and with a seriously poor road leading to them and with at least 100 km to the next similar settlement. In these villages/towns there are activities going on. Kids go to school and adults are busy doing their chores, but the contact with the surrounding world must be minimal and I wonder what they do a Saturday night in for example a little town like Shetpe. There can’t be much entertainment in town and the distance to the next town and the condition of the road makes it difficult to go there. Eventhough I grew up in a small place in Sweden I think I had way better opportunities to interact with people outside my village than the people in these towns and I every time I have visited these small desert towns I get more and more happy that my Mum and Dad didn’t bring me up in a burning hot and sandy town far far far from the rest of the world. Beyneu was the first decent sized town we came to and even that was a town which felt far from the rest of the world, but it had something that we enjoyed highly – running water. We are so used to get as much water as we please from our taps and maybe it takes a tour through the desert and taking care of the daily hygien with less than a liter to understand how precious water really is. Well, it is actually not a real footprint but an oilcloth with a pattern of ladybugs that will provide extra protection from the nasty thorns that could otherwise penetrate the floor of our tent. 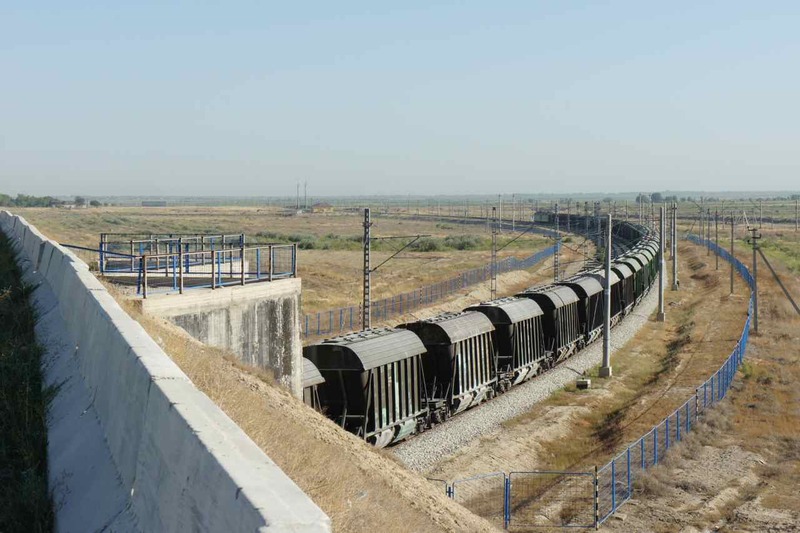 From Beyneu it was about 90 km to the Uzbek border. We didn’t intend to cross the border the same day so we started a bit late. The road towards the border is gravel and full of pot holes. Knowing it would be a race once in Uzbekistan we cycled slowly and went in to one of those little desert villages to buy some cold drinks to our lunch. 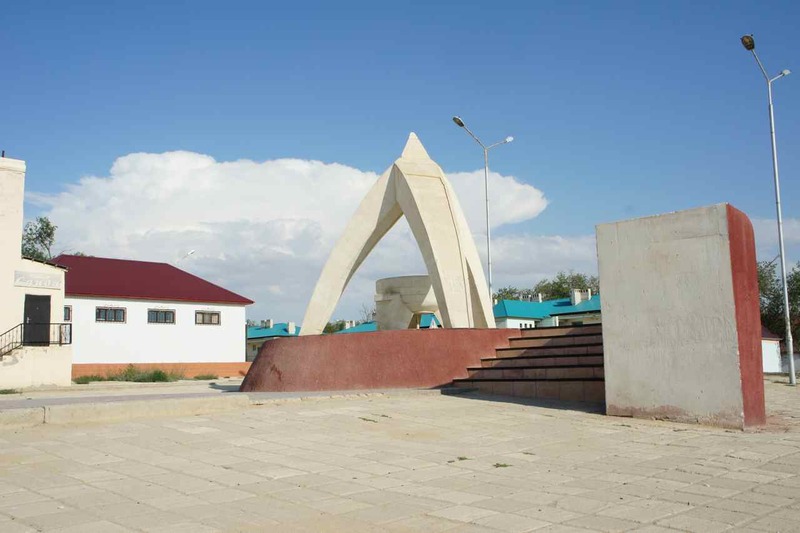 I must say it again – it can’t be fun to grow up in the middle of the desert and the nearest town is a town like Beyneu. 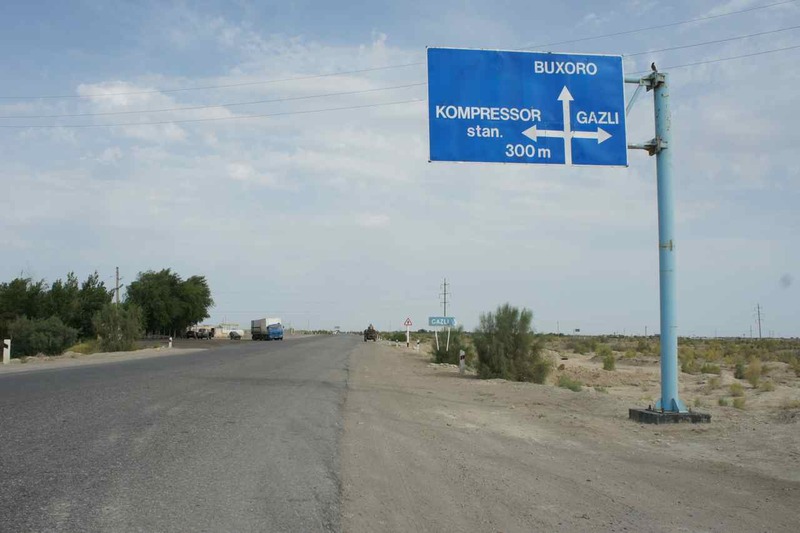 We stopped 6 km short of the border to Uzbekistan. The reason for this was that Uzbekistan has a system where foreign tourists have to register at a hotel at least every third day. It is 430 km from the border to the nearest hotel and therefore our intention was to enter early in the morning and then go as far as we could that day. 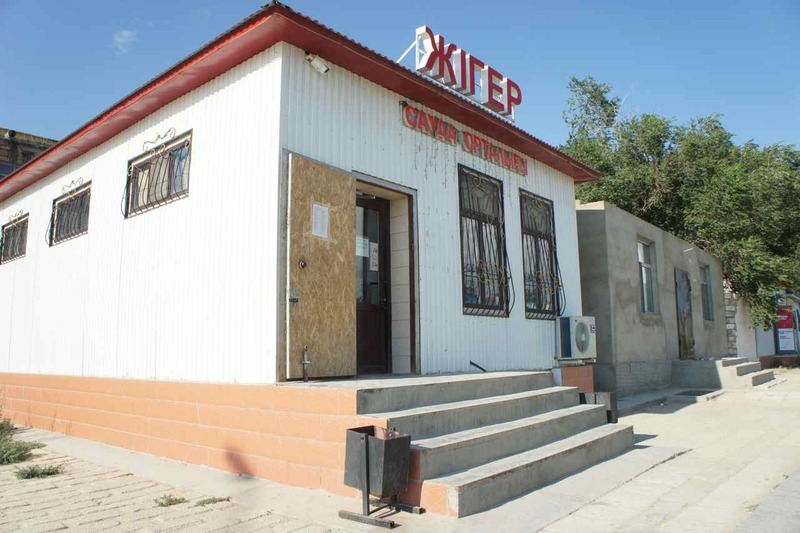 We had learned that the border passage was open 24 hours, but when we arrived at 7.30 we found out that it actually was closed for a shift change between 7-9. At around 9.30 we were let in to the border building and could start the customs procedure. 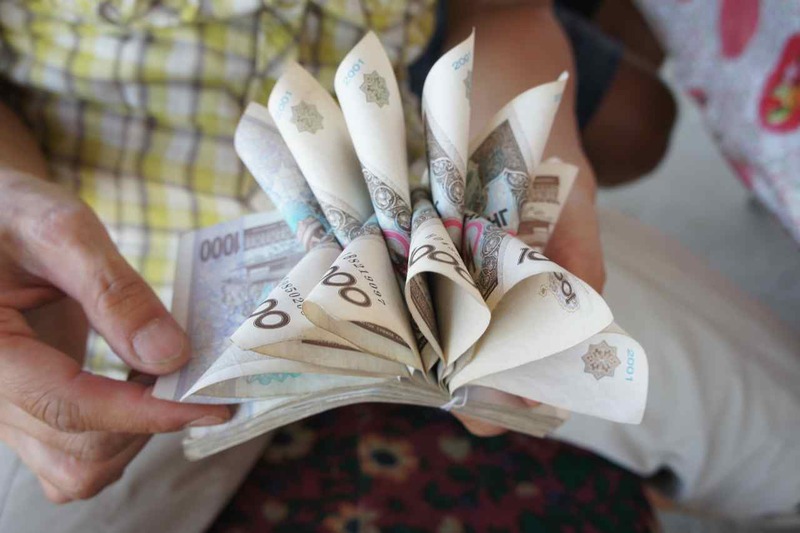 When entering Uzbekistan one has to declare all currency, valuable items, vehicles (bicycles), medicines etc. before entering the country. We were six people in the group and it took until noon until we could start cycling. 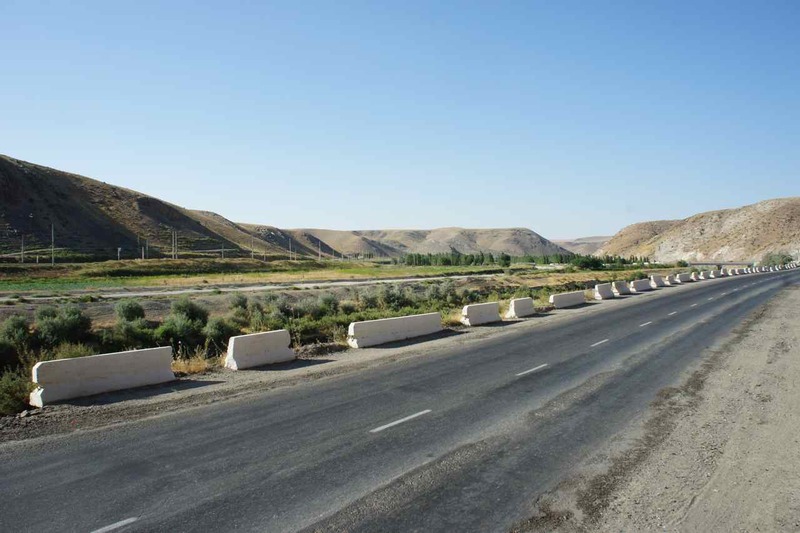 Once inside Uzbekistan the condition of the road improved significantly. 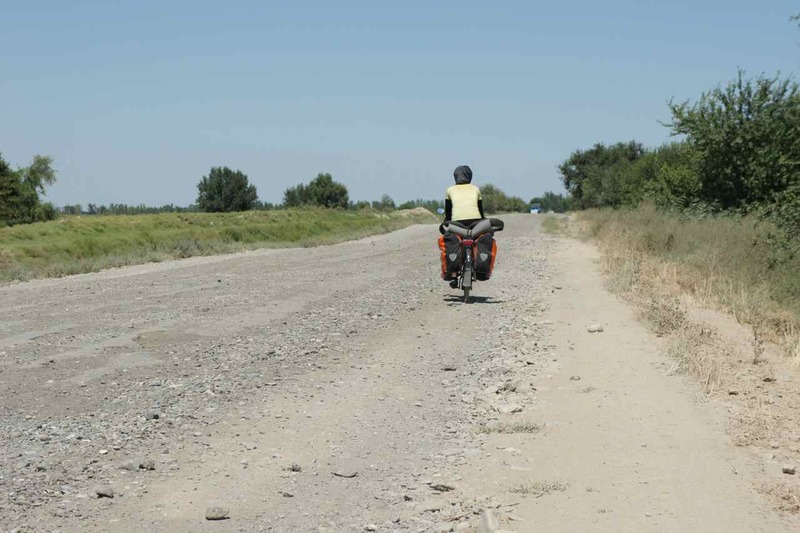 While it was a dirt road on the Kazak side it was a fine asphalt road on the Uzbek side. Sometimes the tarmac was a bit broken but for most of the time it was of good quality. The road is straight to say the least. 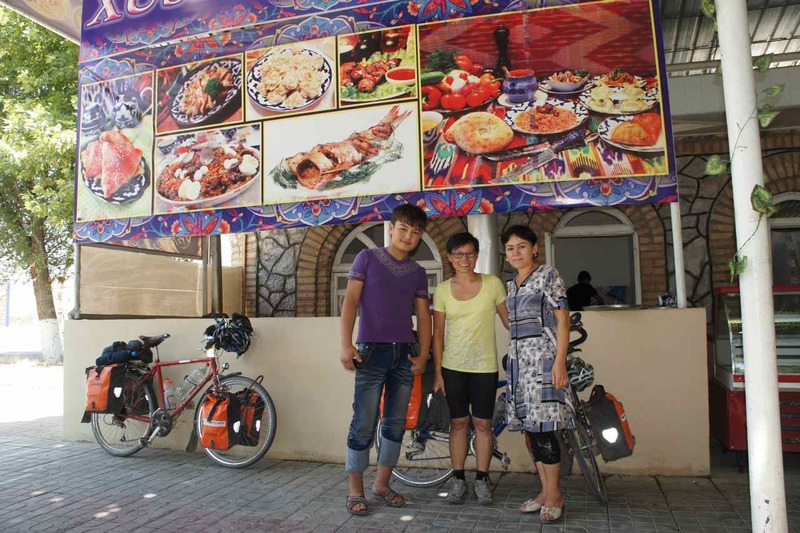 During our first day in Uzbekistan we cycled 110 km without making a single turn. It could have been boring but since we had a good tailwind we could cruise across the desert at good speed. In thai the word for desert is translated as ”sea of sand” and I now I really understand why. The landscape was very flat and when turing around 360 degrees and seing nothing but a sandy horizon line it is not far away to call it ”sea of sand”. Seing a truck approaching from far away was like seeing a ship. First we saw the top of it and then after a while all of it became visable and then it took a long while until we actually met it. This vast land of nothingness is hard to understand and I can’t really tell if I like it or not. 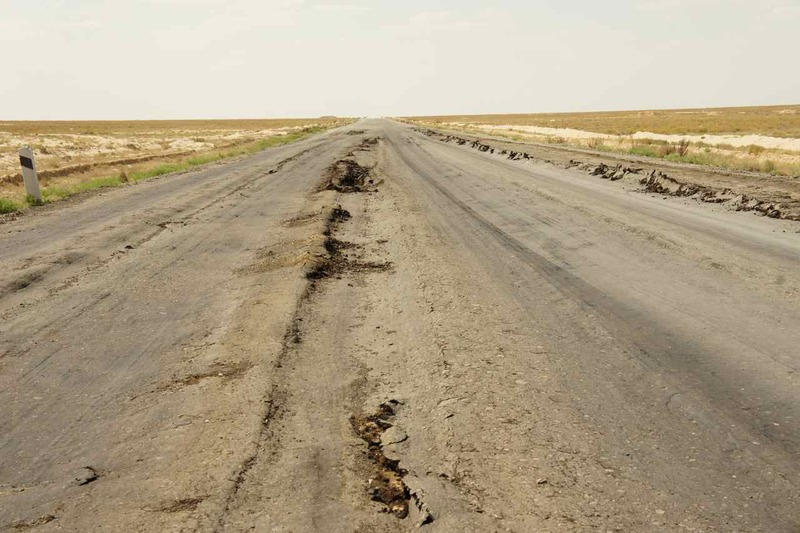 On the bad road in Kazakstan it was a struggle to move forward and all focus was on finding a line through all the pot holes and cracks, but on the good road in Uzbekistan there was more time to look around. I wouldn’t like to live in this area but I am glad to have been able to visit it. Being in a group of friends also makes it easier, but I think I could also enjoy the solitude if we would travel without our current companions. 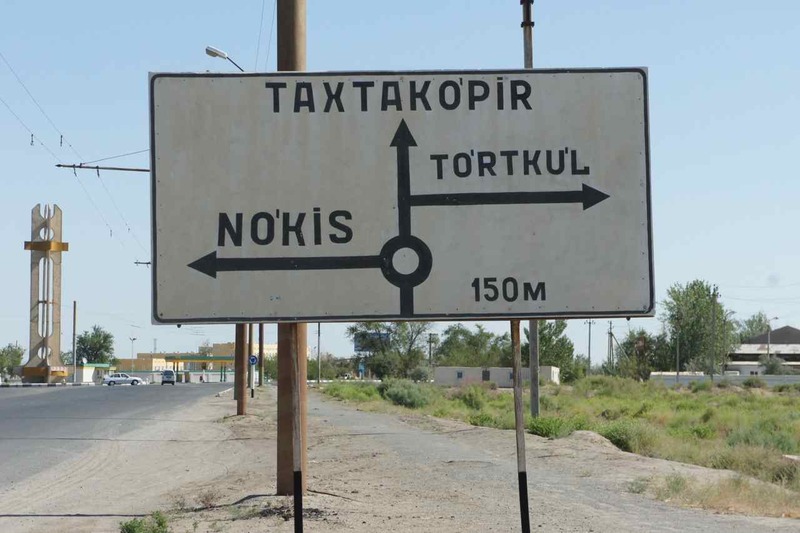 Tortkul to the right – will this be the place where will run out of toothpaste Micke??? 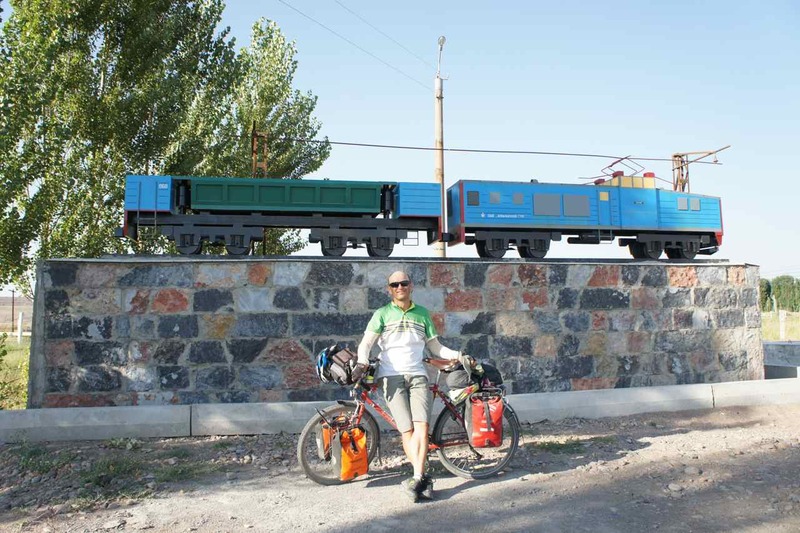 During the second day in Uzbekistan we cycled 183 km and that is the longest I have ever cycled with a loaded touring bike. 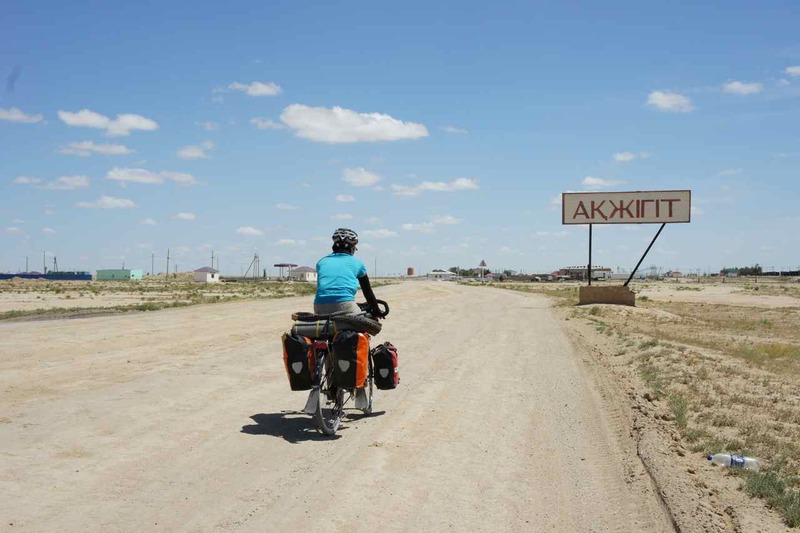 We had to make it reach Nukus in three days and decided to make use the middle day to get some extra kilometers done. Our group is not really a group but individuals who happen to travel the same route at the same time. We cycle at different speeds and soon after we start biking we are all spread out, but we agree on where to meet around lunch and where to stop. During this long day there was a misunderstanding and half of the group went camping while our New Zealand friend and ourselves continued 2 km past the agreed camp site to a truck stop where we could enjoy a shower, food at the restaurant and sleep for free at the eating platforms outside the restaurant. After 183 km on the road it felt very good to be able to shower properly instead of doing it with 700 ml water. 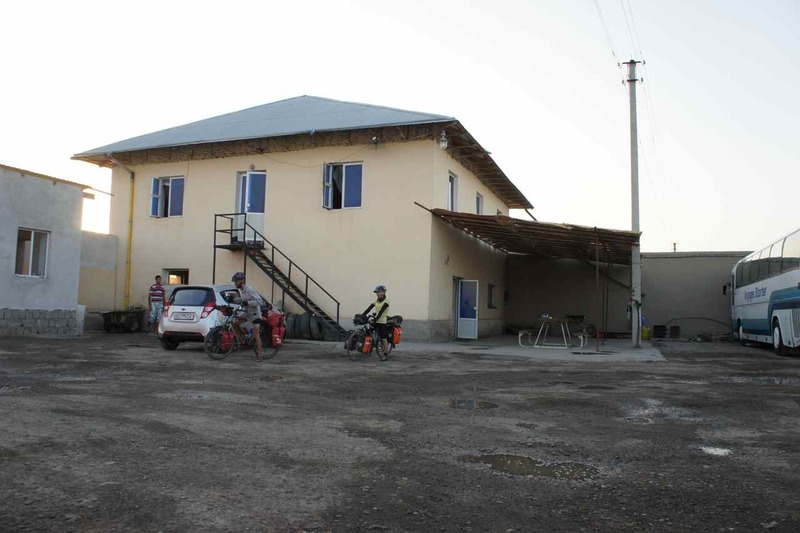 The following morning we had some 35 km to ride to Kungrad and right outside Kungrad the desert ended. It was not a gradual change, it was rather like a line in the terrain. West of that line sandy desert and east of it greenery. 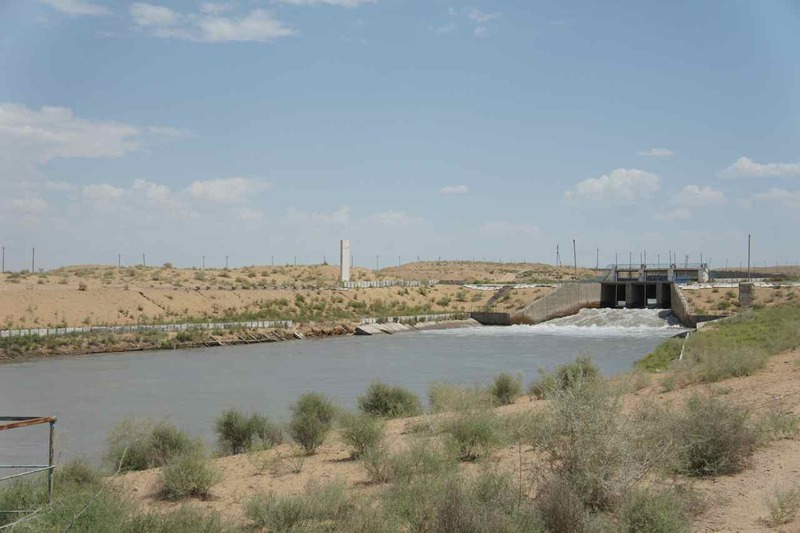 It is the water stolen from the Aral Sea that makes it possible to create green areas in the desert. When we cycle in these green areas we feel like when cycling in Thailand. It is hot and a lot more humid than in the desert. Apart from the cotton fields there are lots of rice paddies and fields where vegetables are grown. At the roadside people sell water melons from small stalls and the villages are close to each other and there are a lot of people everywhere. But the greenery ends just as quickly as it starts. 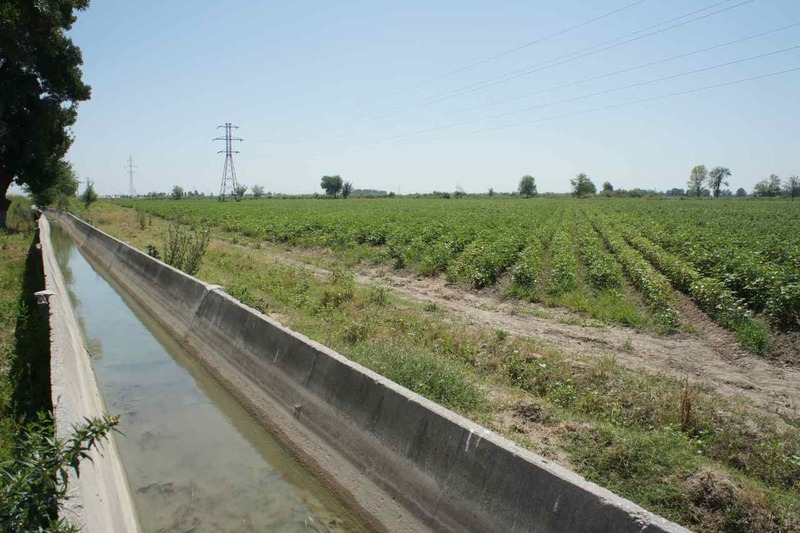 It is so evident that where there are no irrigation canals, there will simply be a sandy desert. 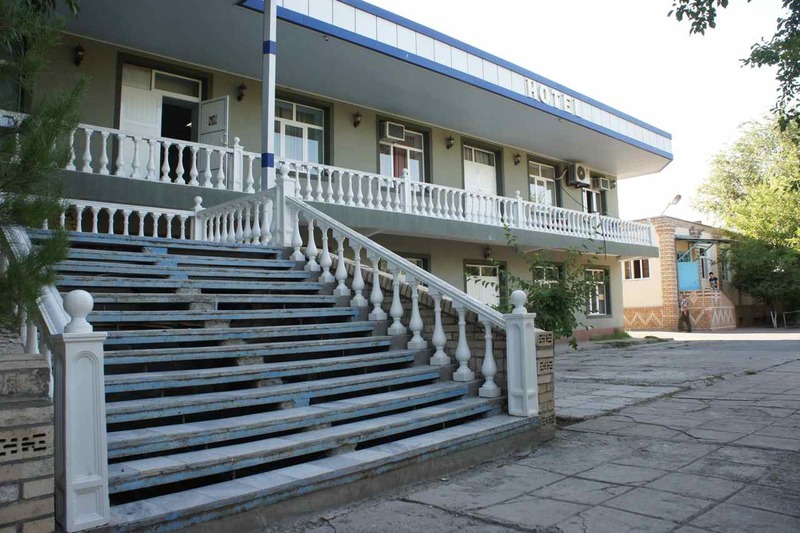 Hotel Nukus looking good from the outside…. But not as good on the inside…. 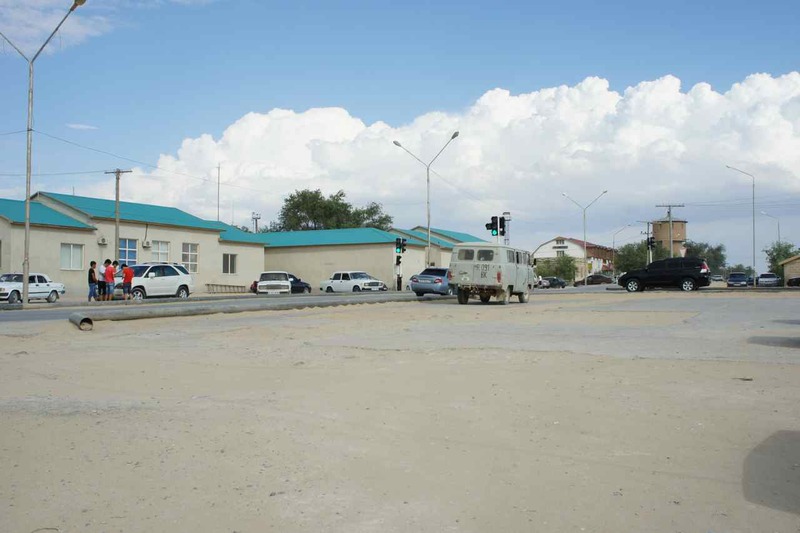 Arriving at Nukus we checked in at the cheapest hotel in town. It looked good from the outside, but the interior certainly had seen better days. Everything was in desperate need of repair and the 12 dollars per night each of us paid felt like a bit to much for what we got. Personally I would have prefered to stay at place like the truck stop last night, but we had to stay at the hotel to get the registration. 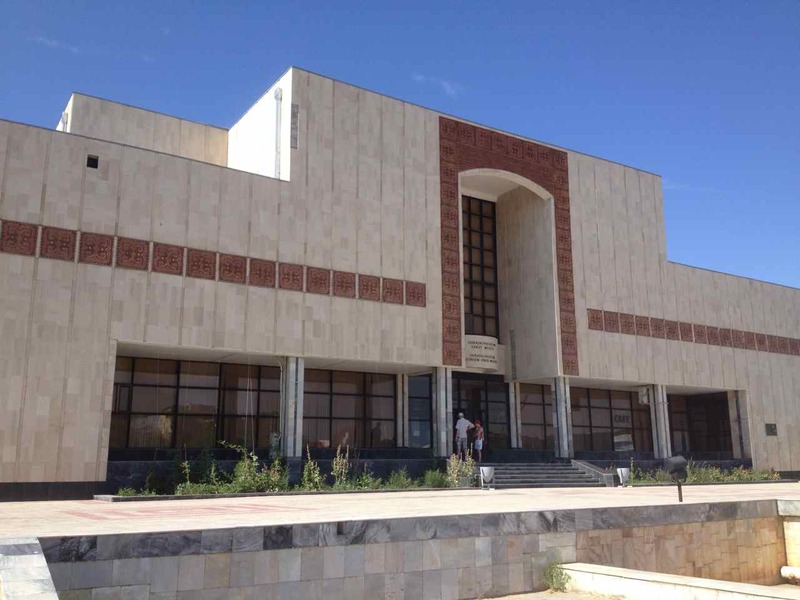 Nukus has one attraction and that is Igor Savitsky’s art museum. Savitsky was an artist from Moscow who settled down in Nukus and started to collect avant garde art from all corners of the Soviet union. 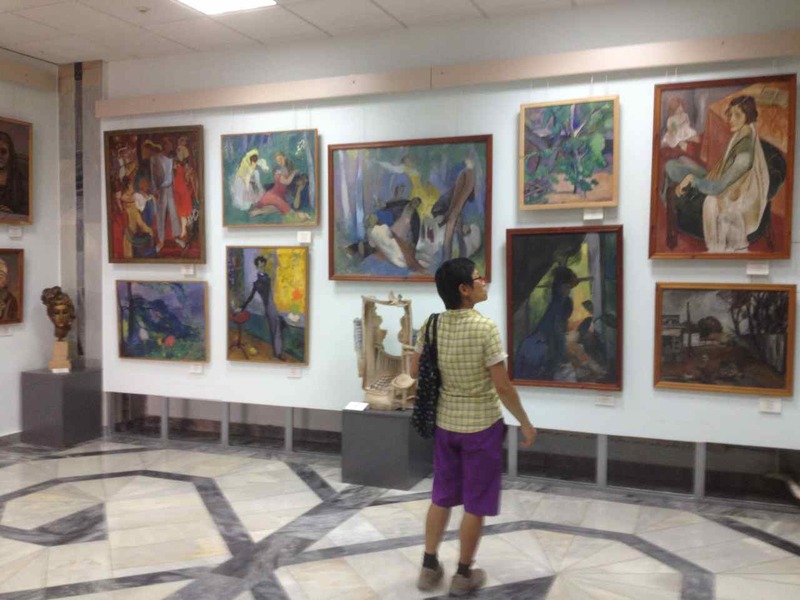 The Kremlin knew about this, but since it was so far off from everything they let him do it and now his museum is the place to visit if one wants to see the art from artists who didn’t follow the communist art style. 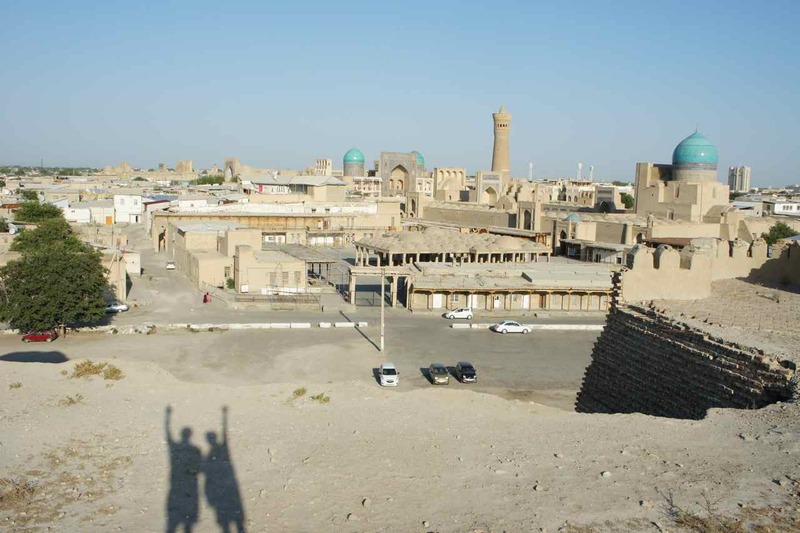 It took us two days to cycle from Nukus to the ancient silk road town of Khiva where we are right now. 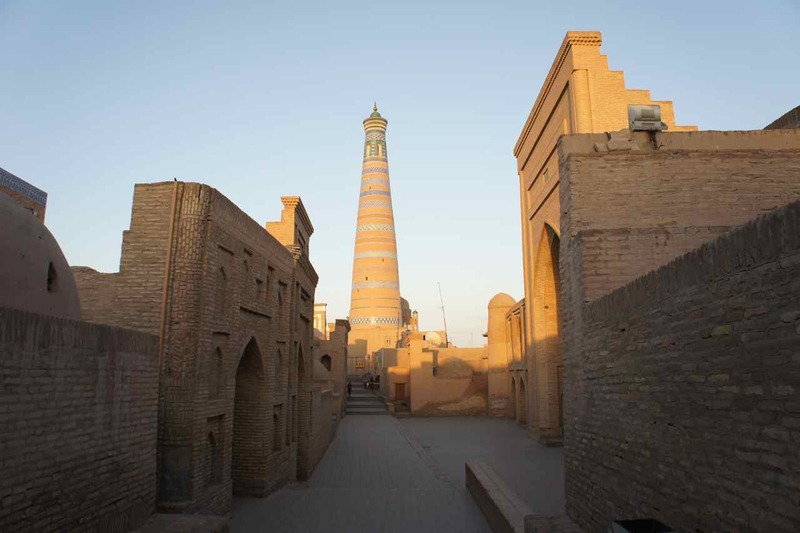 Khiva’s old city is just wonderful and not until we arrived here did we really get the feeling that we are traveling along the classic silk road. 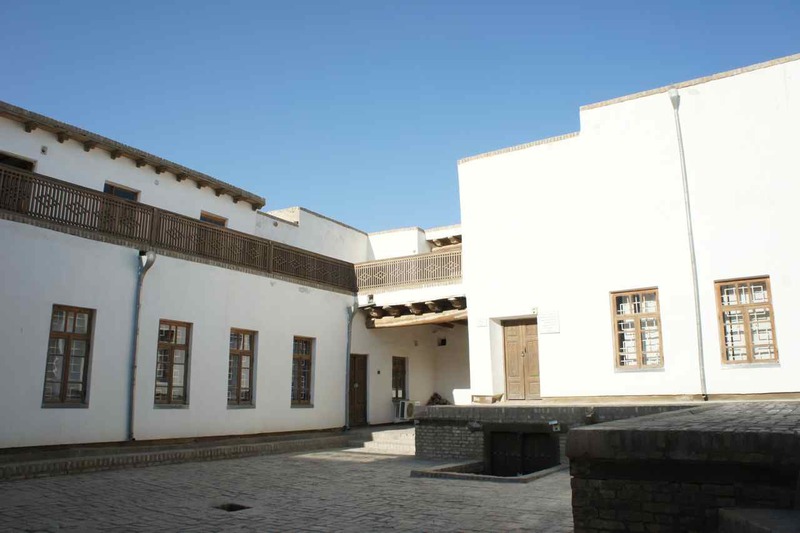 Take a look at the post Wej just made (in thai) and you will see some pictures of the old town in Khiva. 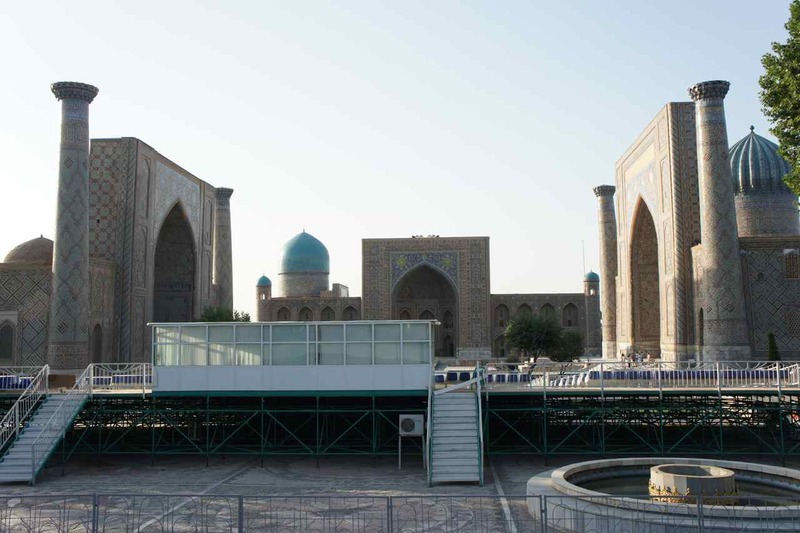 Tomorrow we will set out for the four day ride to Bukhara which is the next classic town on the silk road. This entry was posted in Posts in English on July 10, 2013 by admin. This entry was posted in Posts in Thai / โพสต์ภาษาไทย on July 9, 2013 by admin.